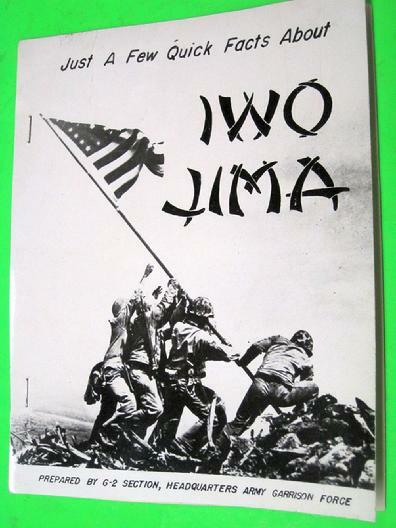 UH235 "Just A Few Quick Facts About IWO JIMA"
UH228 WW II Pamphlet "ABOUT FORT GEORGE MEADE MARYLAND"
UH216 Unit History "THE STORY OF THE Eleventh ARMORED DIVISION, THUNDERBOLT"
UH64 THE BIG GUN ABERDEEN PROVING GROUND MARYLAND, Ordnance Department, U.S.A., Aberdeen Proving Ground Maryland, copyright 1918, hardback, 214 pp., contains numerous photographs, rosters and advertisements. 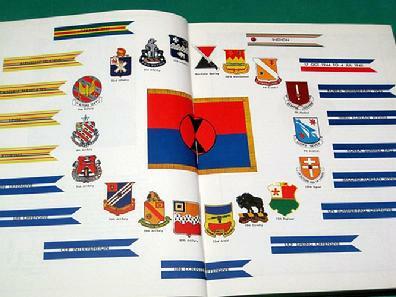 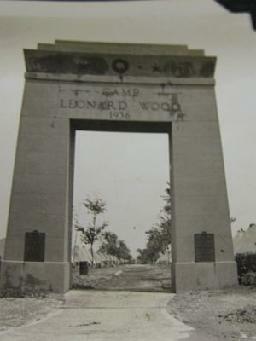 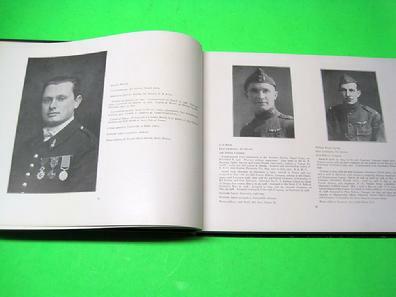 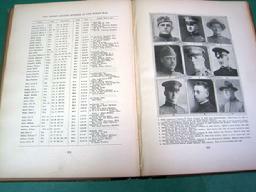 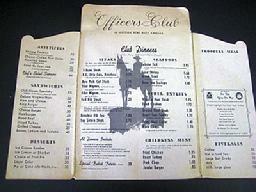 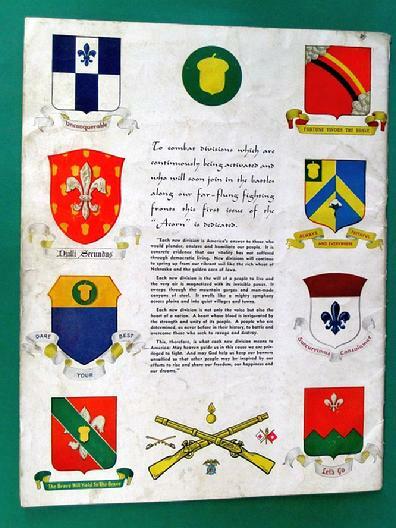 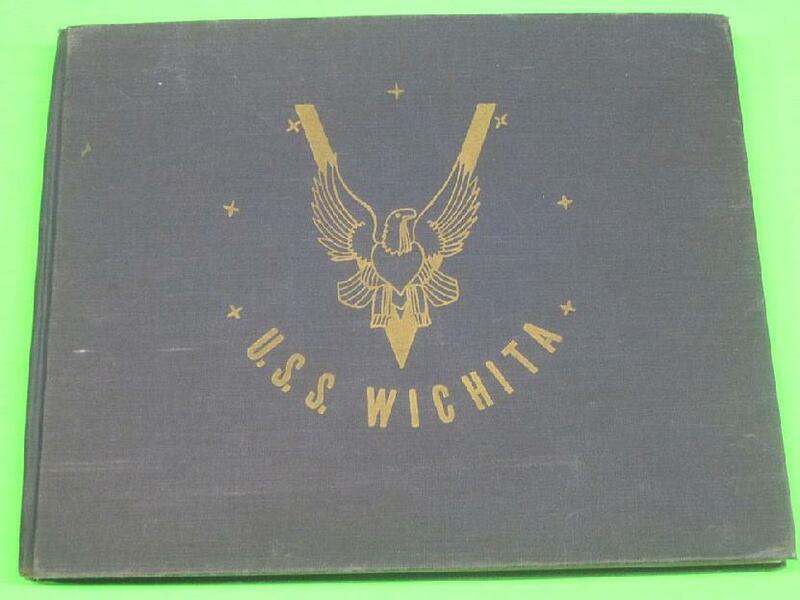 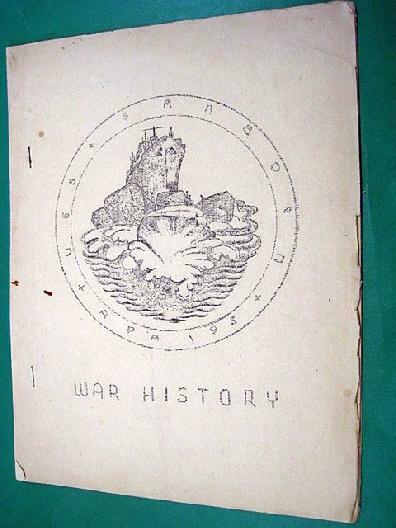 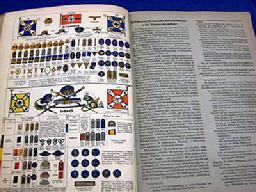 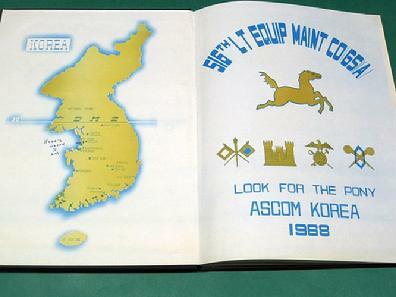 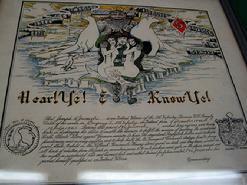 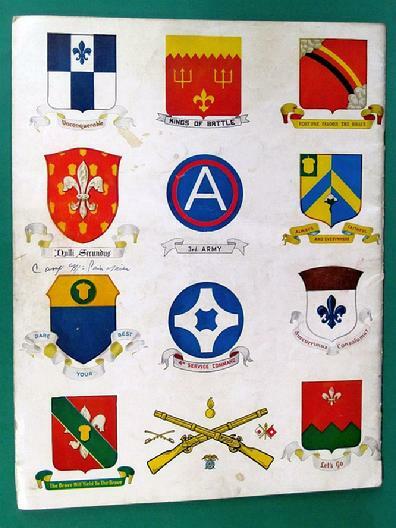 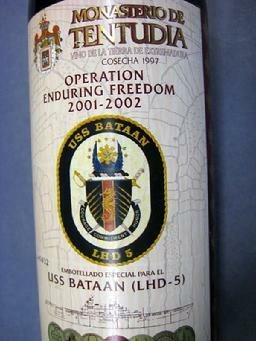 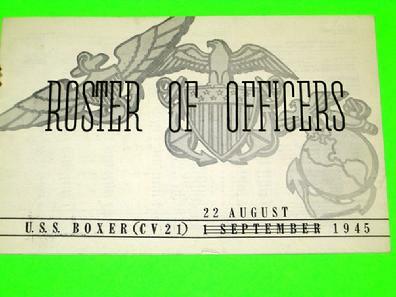 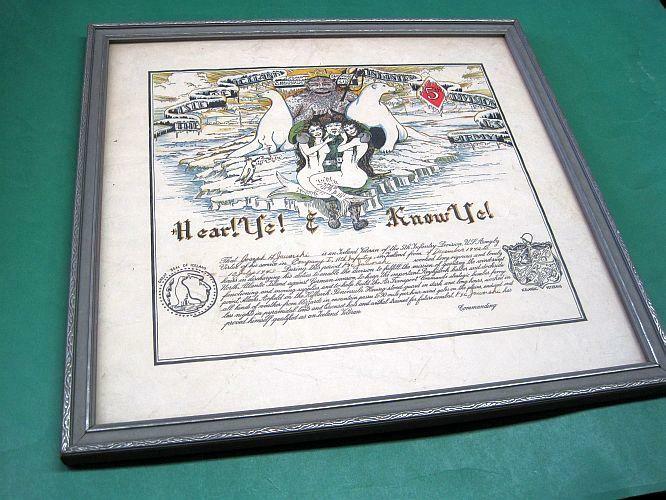 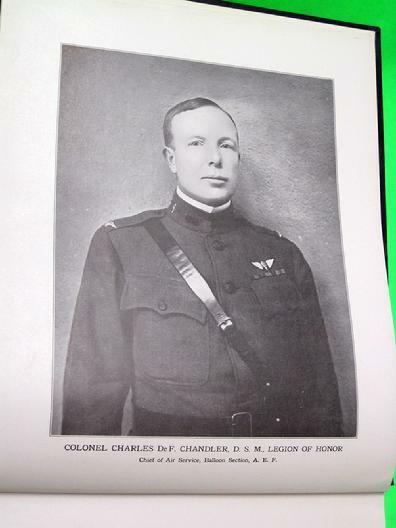 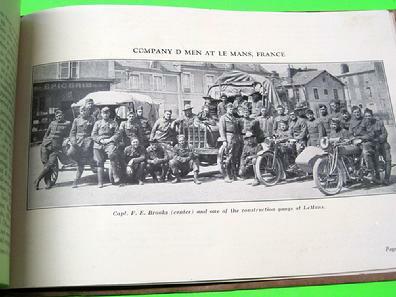 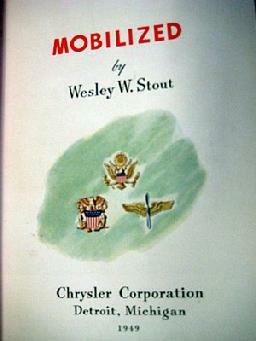 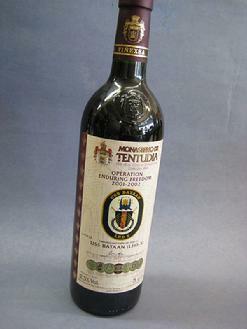 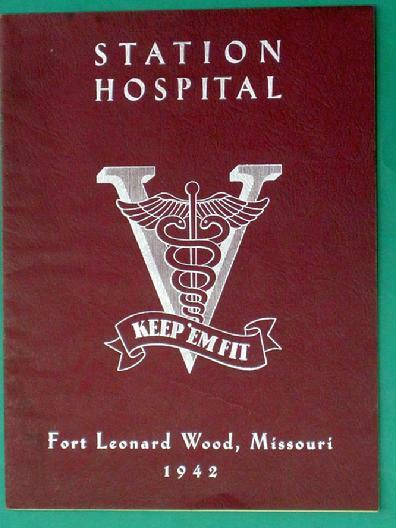 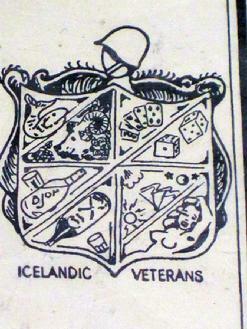 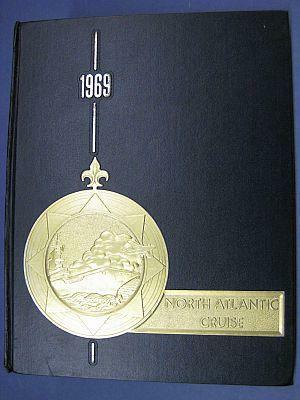 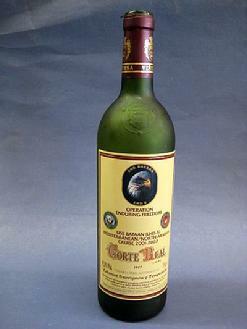 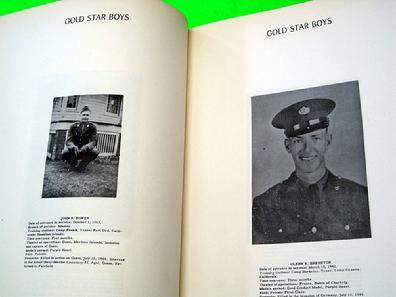 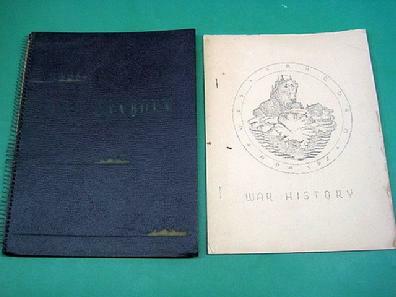 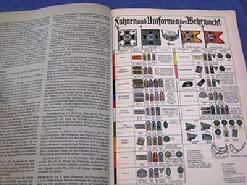 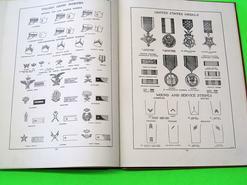 It also has a section on insignia of the U.S. Army and Navy plus insignia of France, Belgium and Italy. 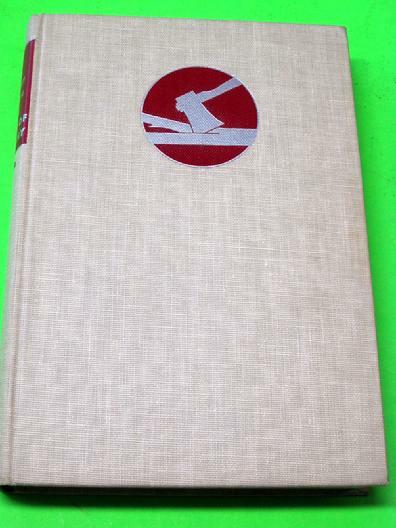 Very good condition, $125. 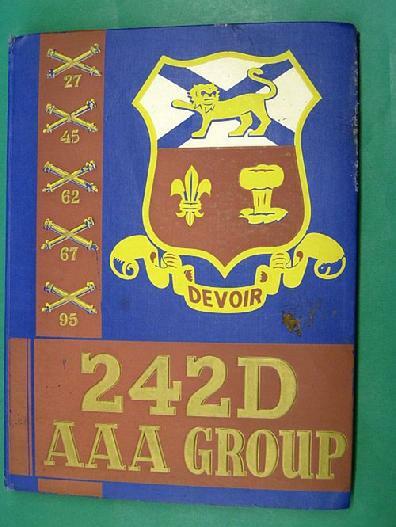 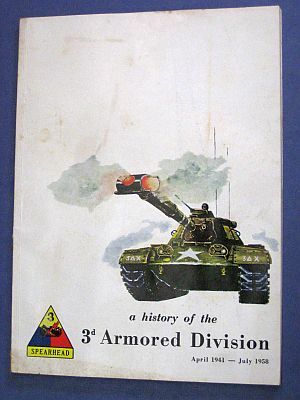 UH211 WW II 11th Armored Division Unit History. 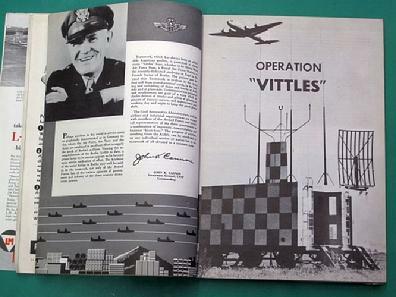 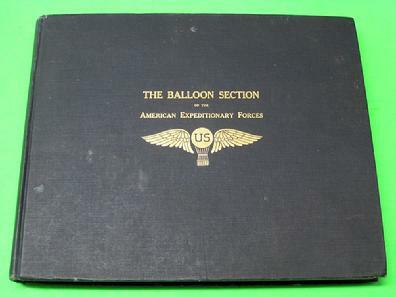 See our AVIATION section for photos of this unit history. 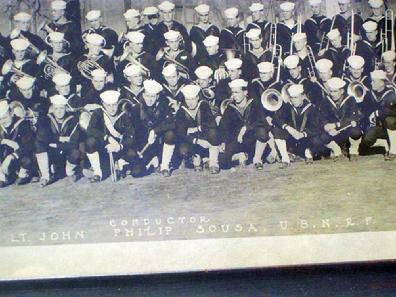 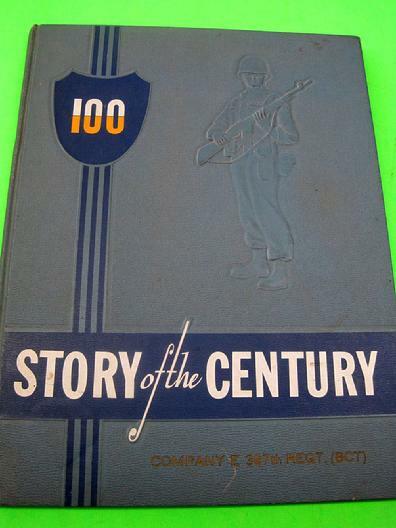 UH207 Unit History "Story of the Century"
UH206 U.S.S. 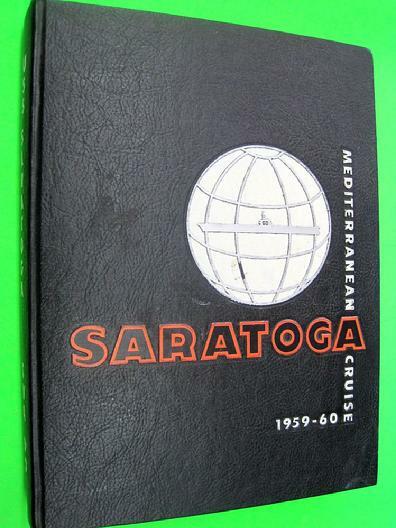 SARATOGA (CVA-60) 1959-60 Mediterranean Cruise Unit History. 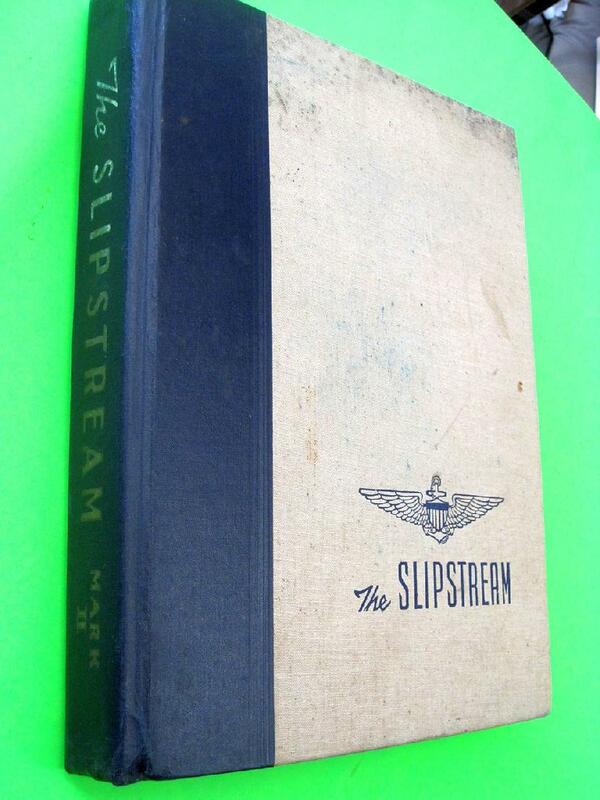 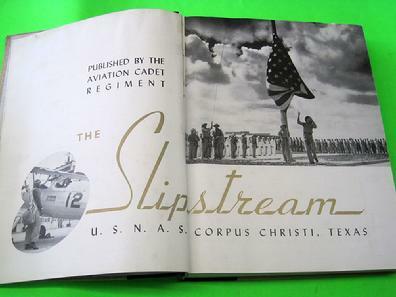 UH204 World War II Era "THE SLIPSTREAM"
This grouping consists of three Unit Histories of the 11th Armored Division, 4 maps, a patch and 2 decals. 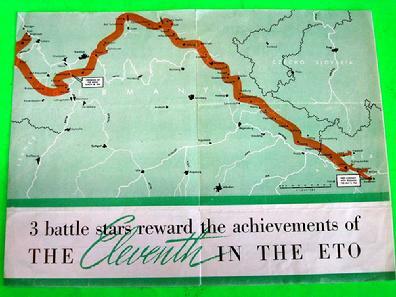 #1 Unit History "3 Battle stars reward the achievements of THE Eleventh IN THE ETO." 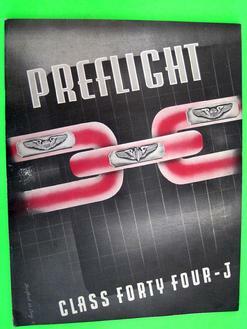 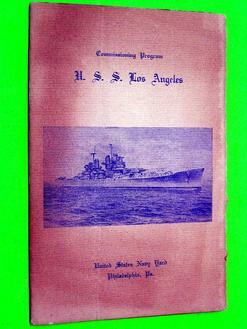 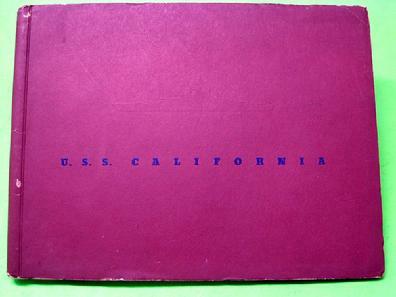 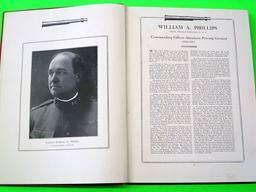 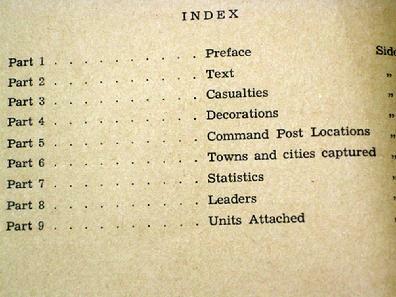 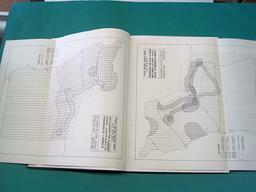 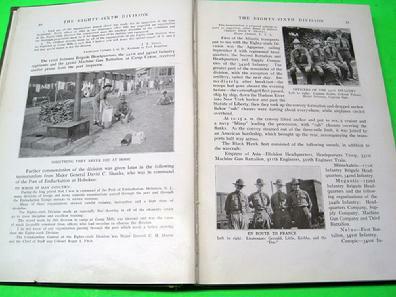 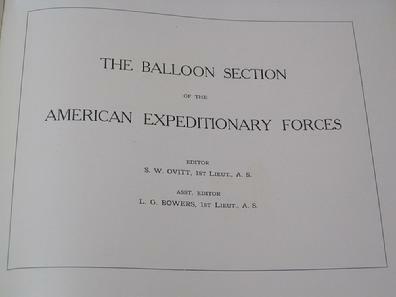 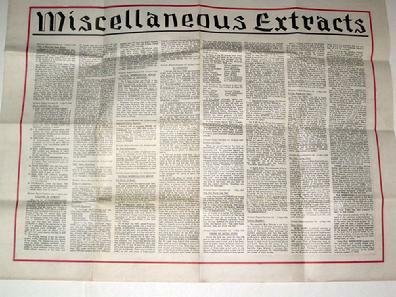 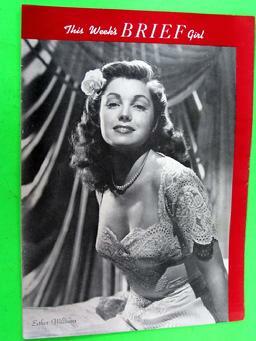 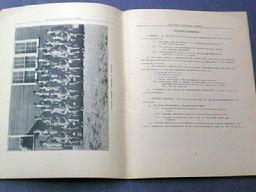 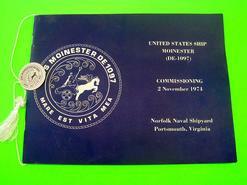 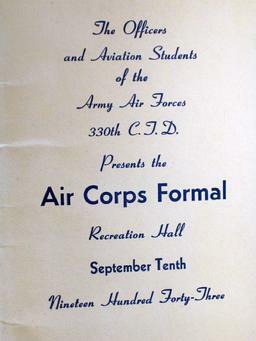 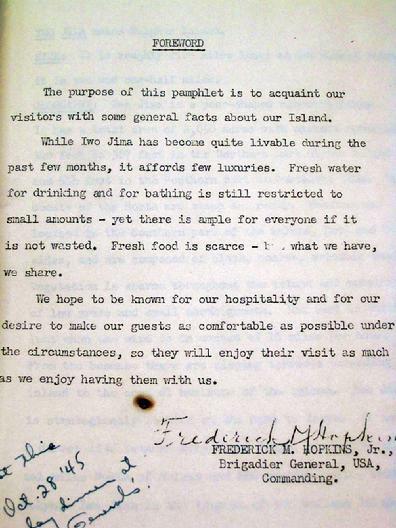 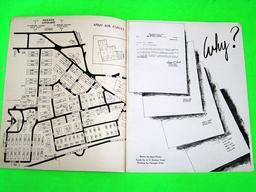 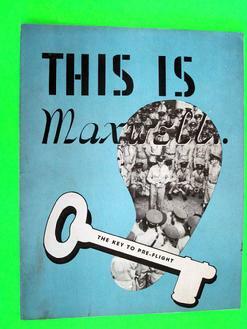 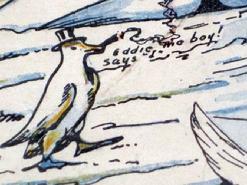 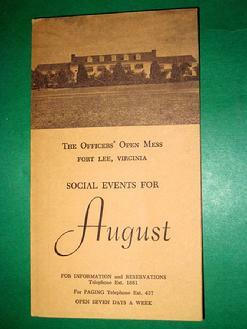 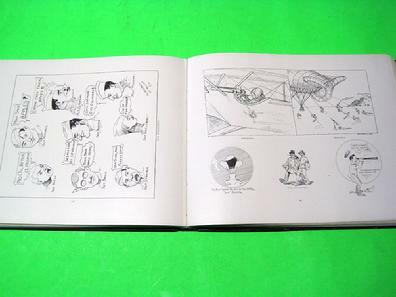 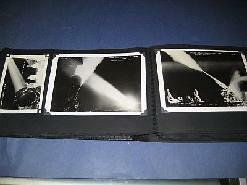 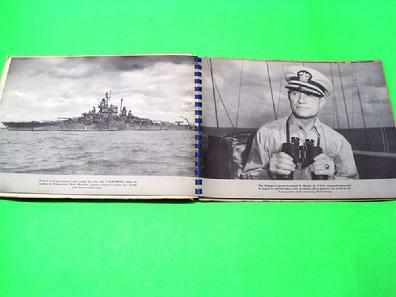 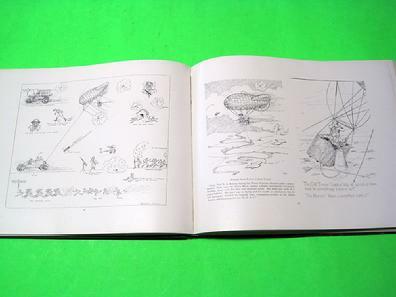 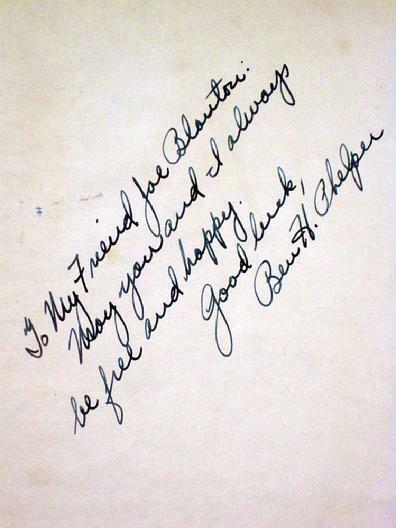 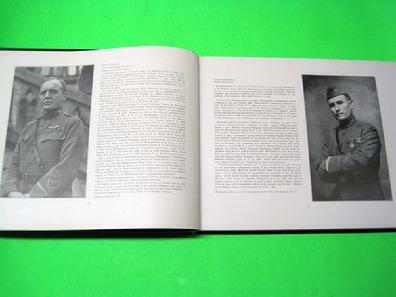 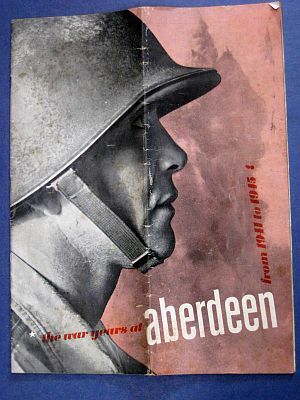 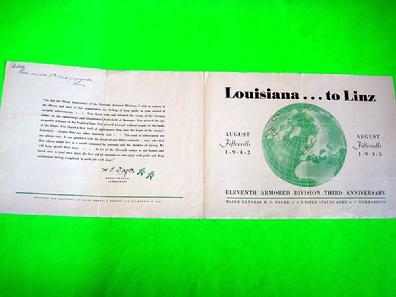 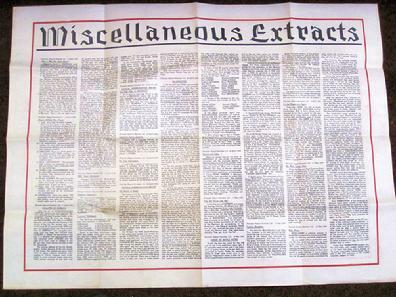 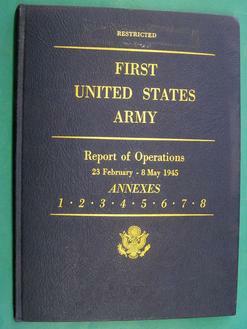 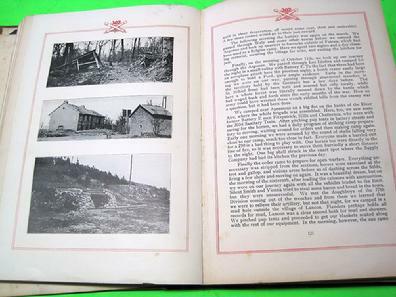 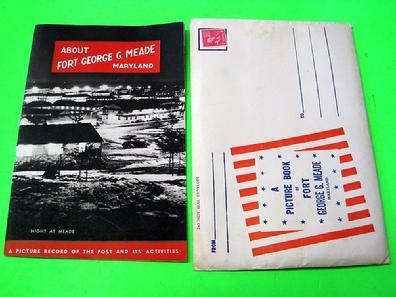 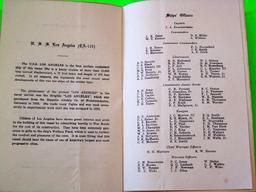 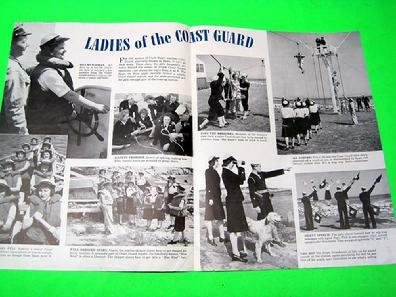 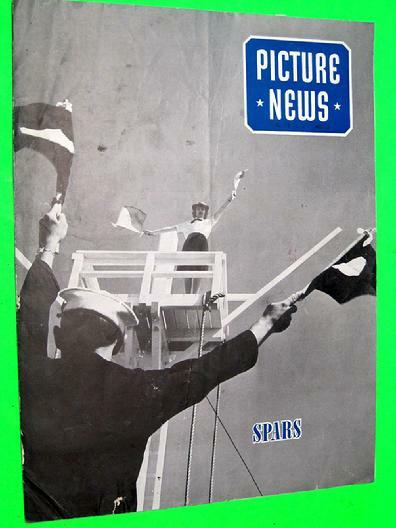 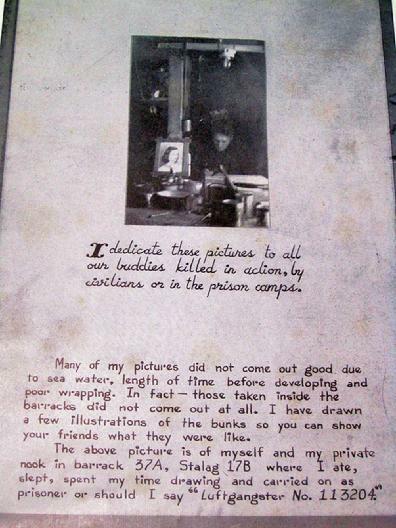 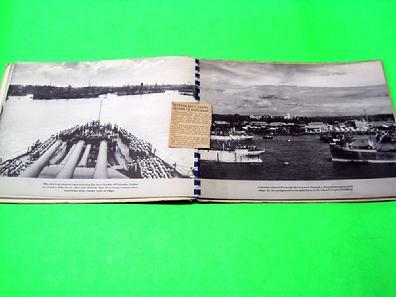 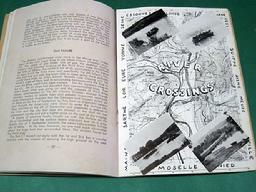 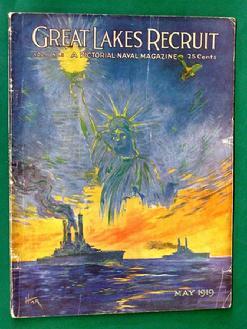 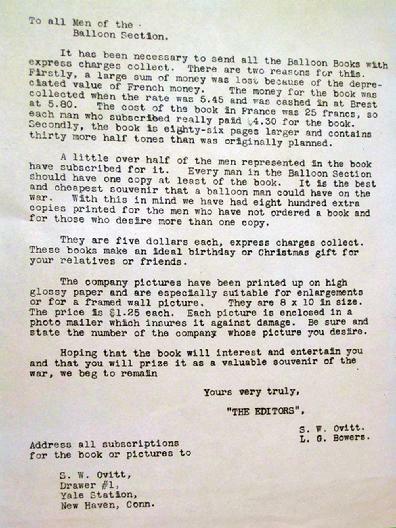 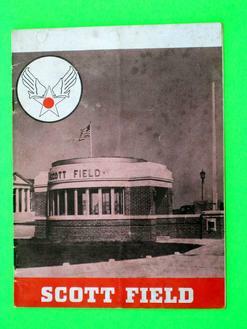 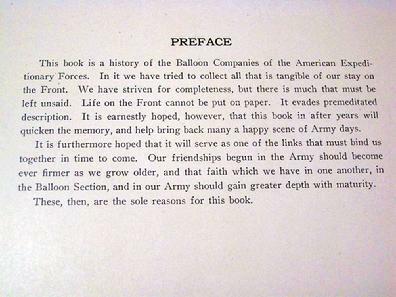 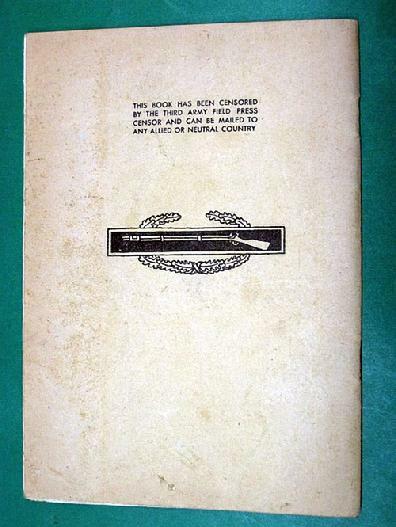 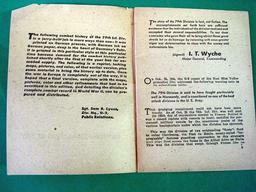 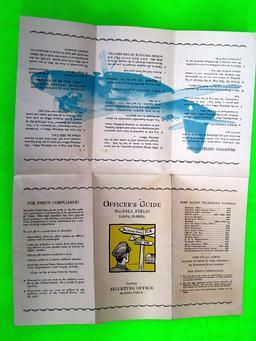 9 by 11 1/2 inches in size, 4 pages and in good condition. 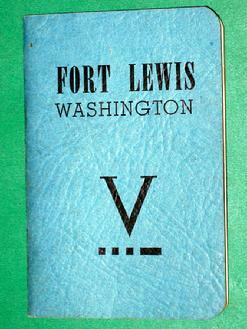 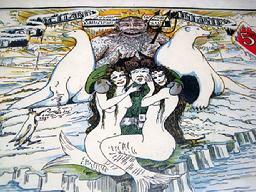 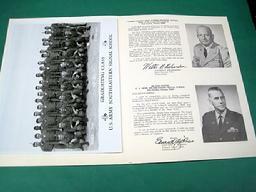 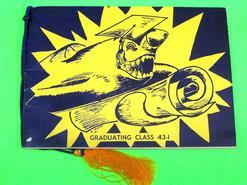 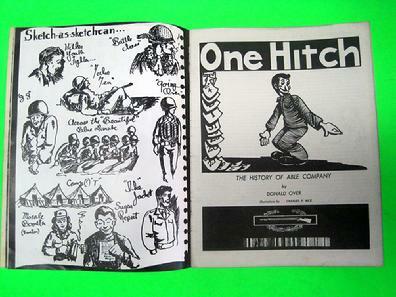 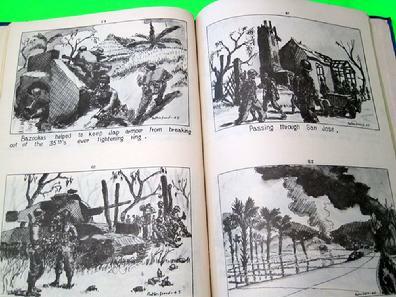 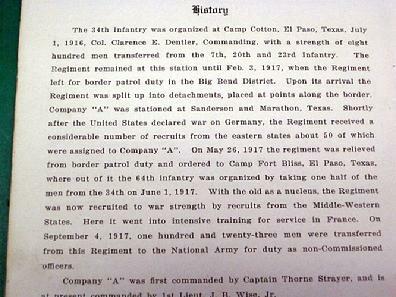 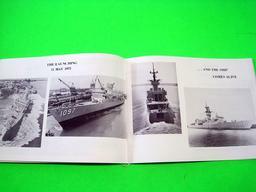 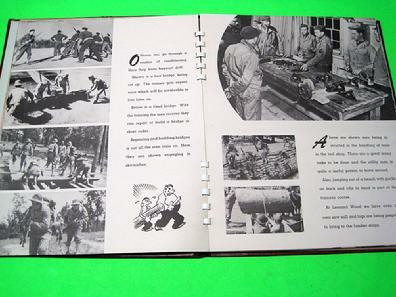 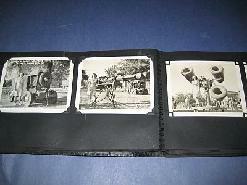 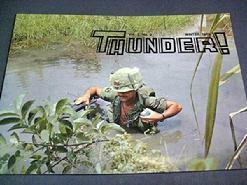 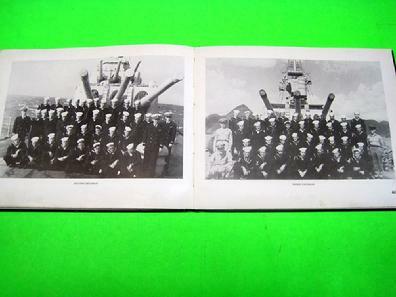 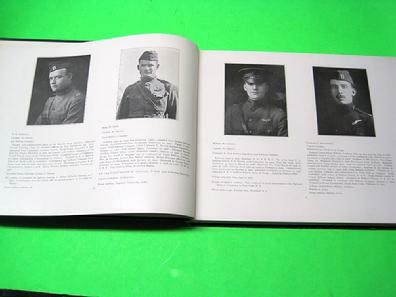 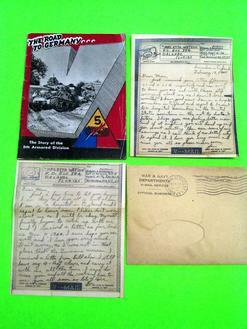 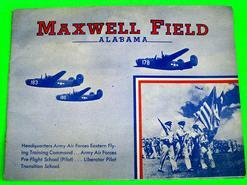 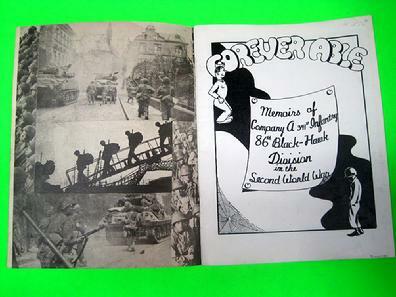 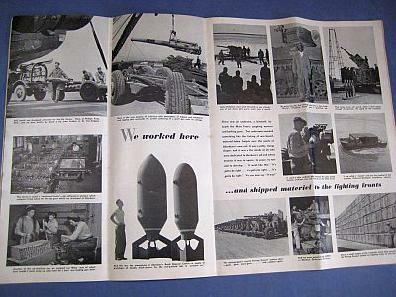 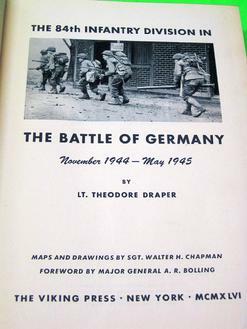 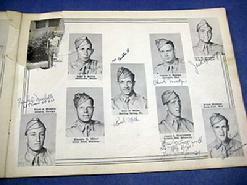 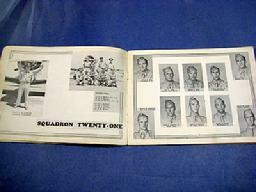 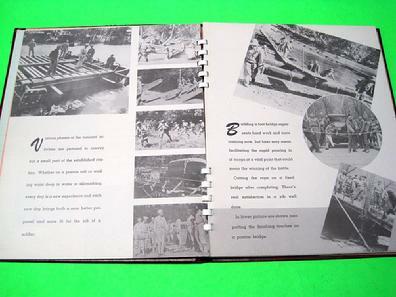 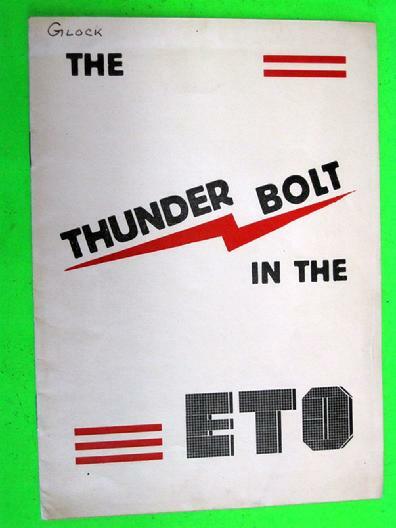 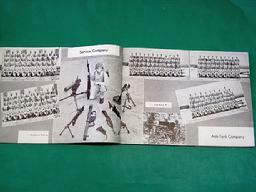 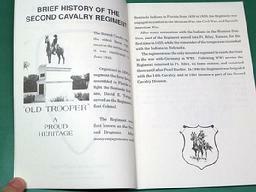 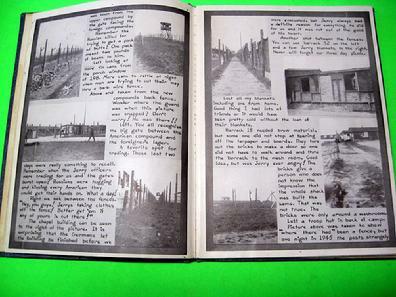 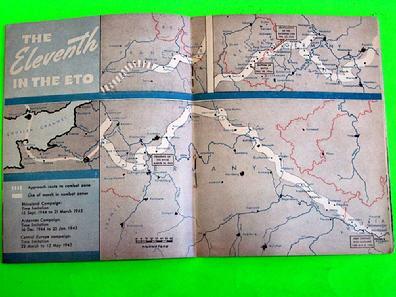 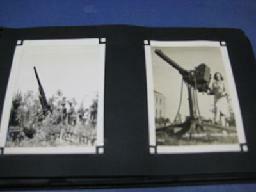 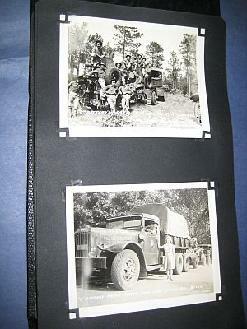 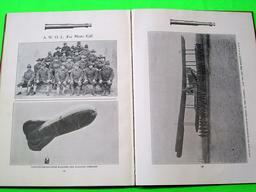 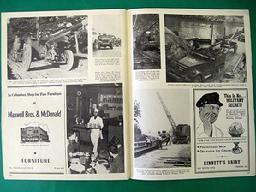 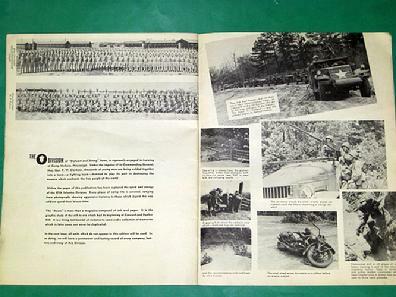 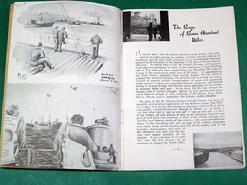 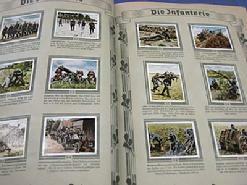 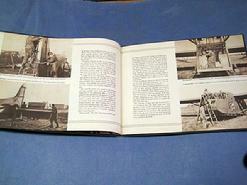 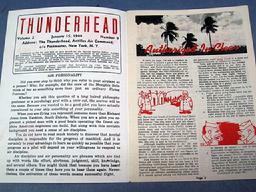 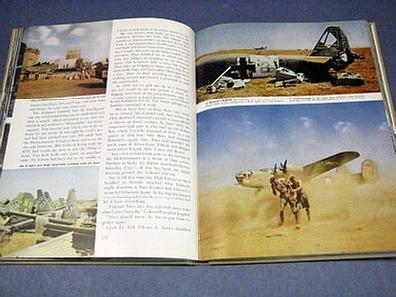 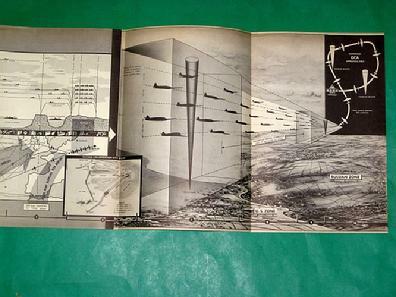 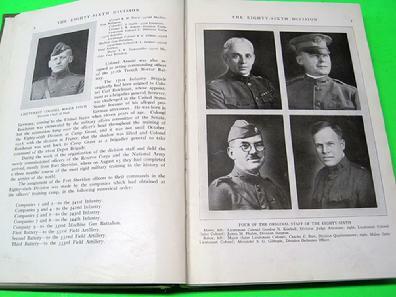 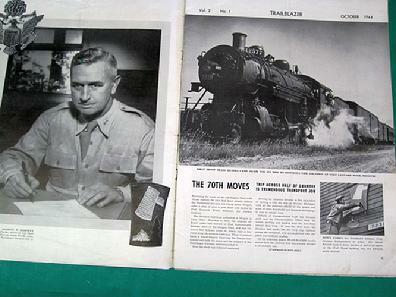 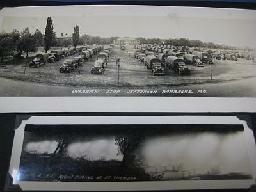 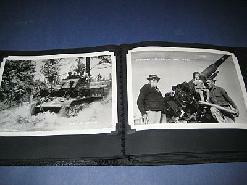 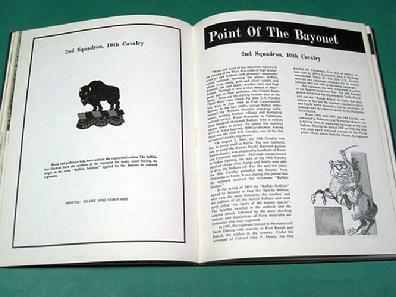 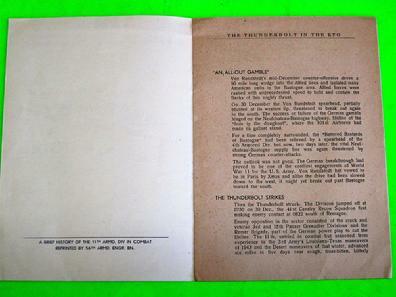 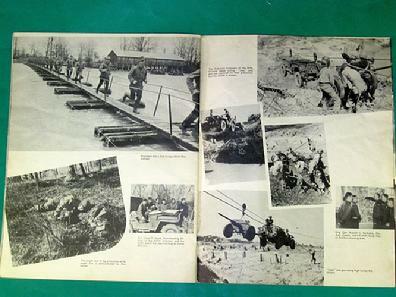 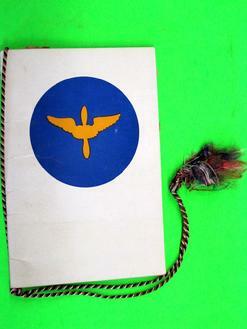 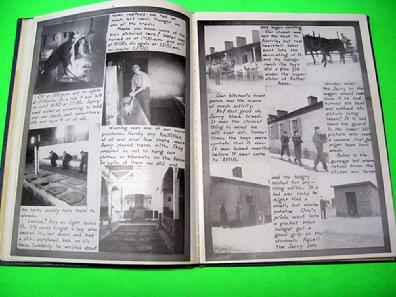 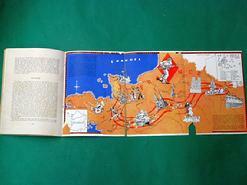 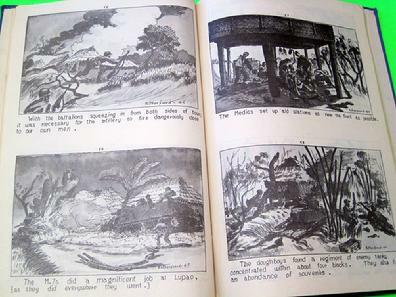 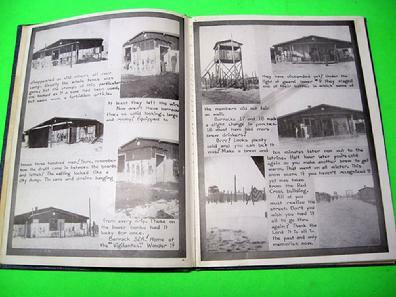 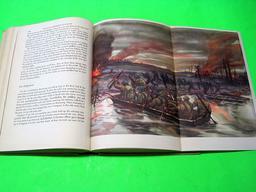 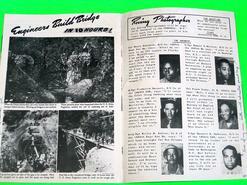 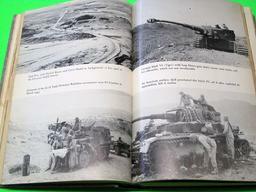 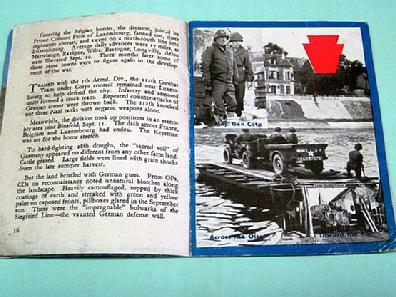 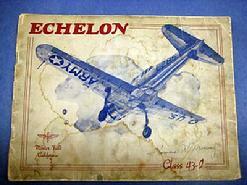 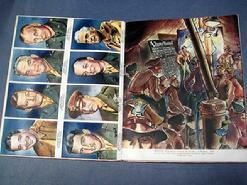 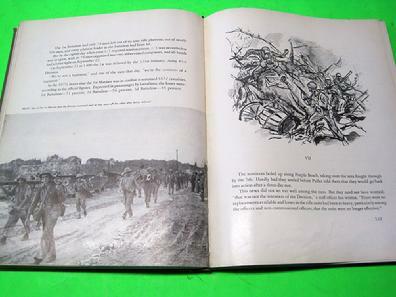 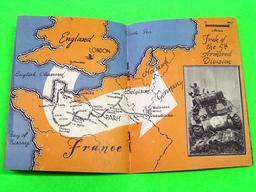 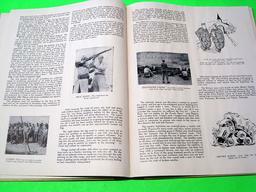 #2 Unit History "THE THUNDER BOLT IN THE ETO" 5 3/4 by 8 inches in size, 8 pages and in excellent condition. 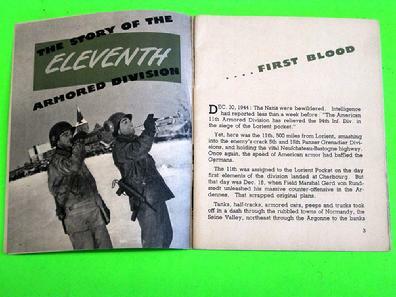 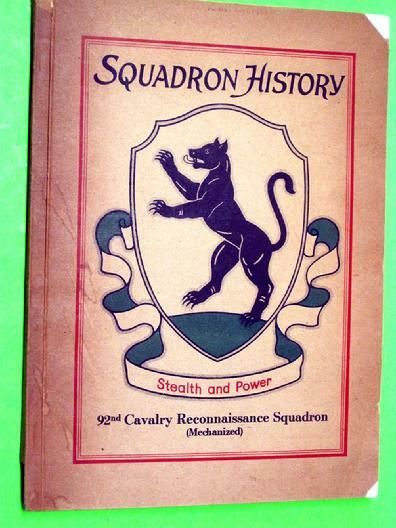 #3 Unit History "THE STORY OF THE Eleventh ARMORED DIVISION, THUNDERBOLT" 4 by 5 inches in size, 32 pages, excellent condition. 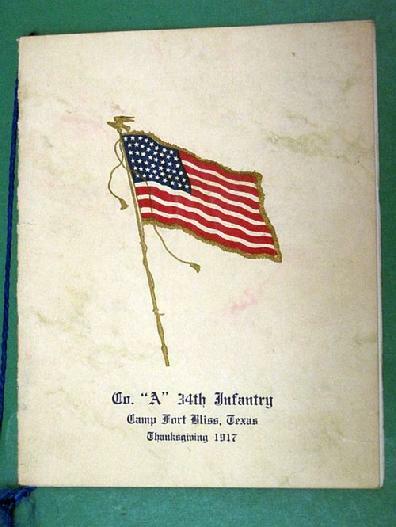 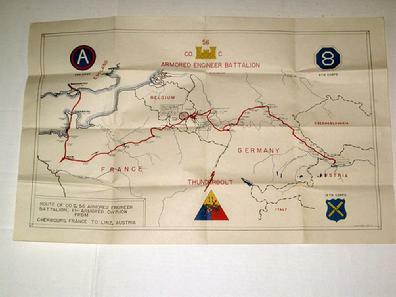 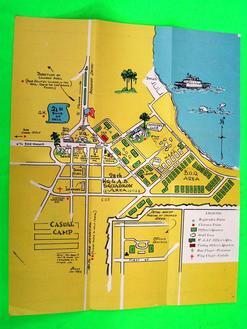 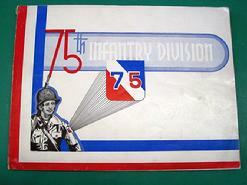 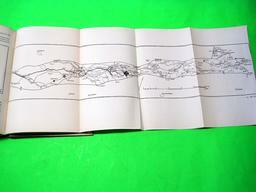 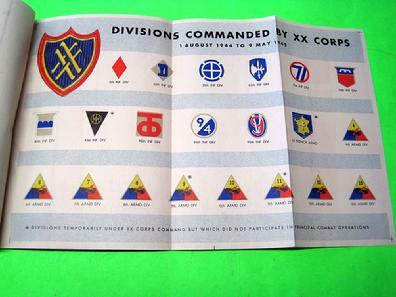 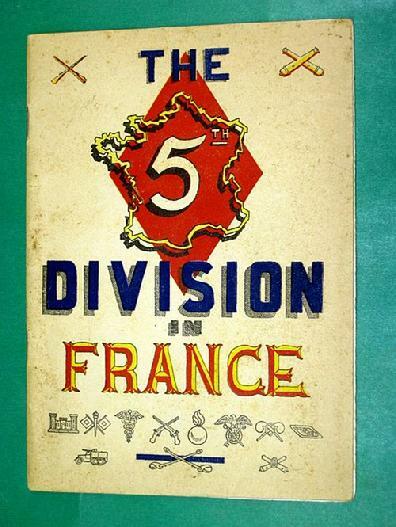 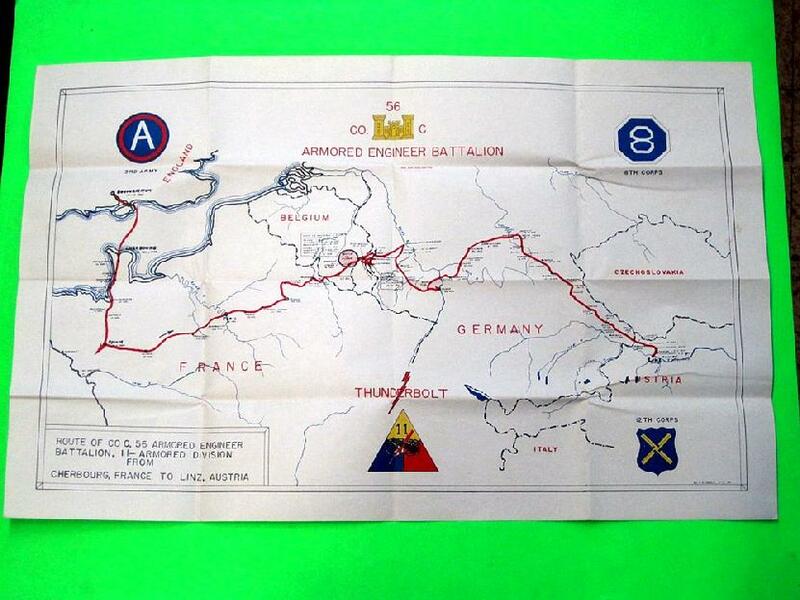 #4 Map 56th Armored Engineers Battalion, 16 by 26 inches in size, one-sided, folded but in excellent condition. 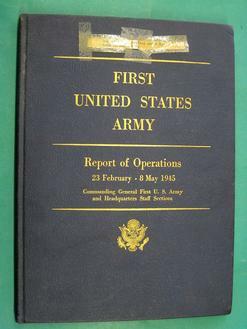 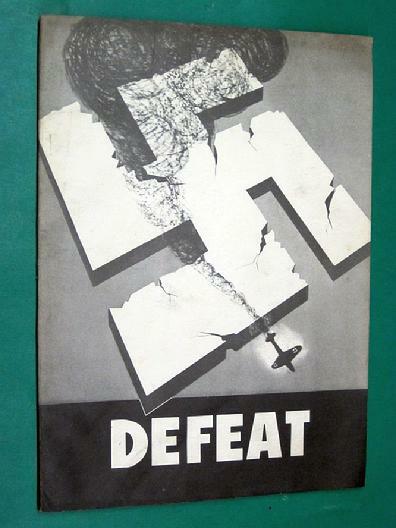 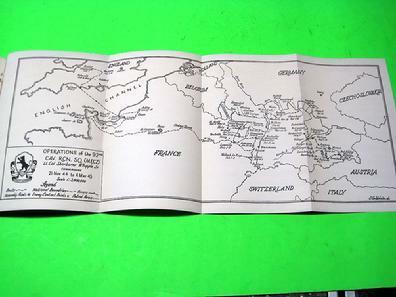 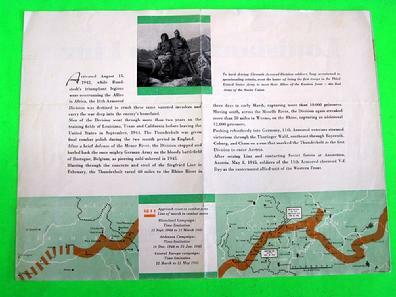 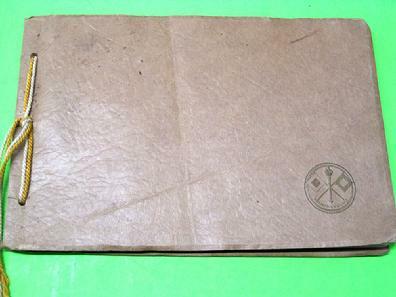 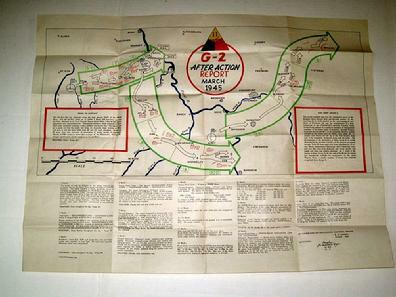 #5 Map "G2 AFTER ACTION REPORT MARCH 1945" 22 by 29 inches in size, one-sided, folded but in excellent condition. 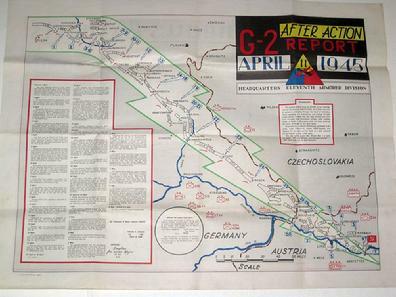 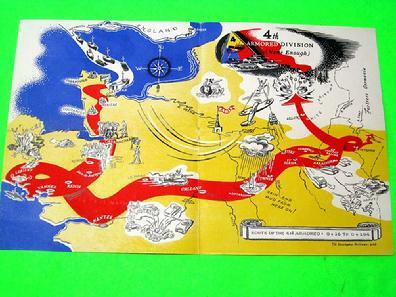 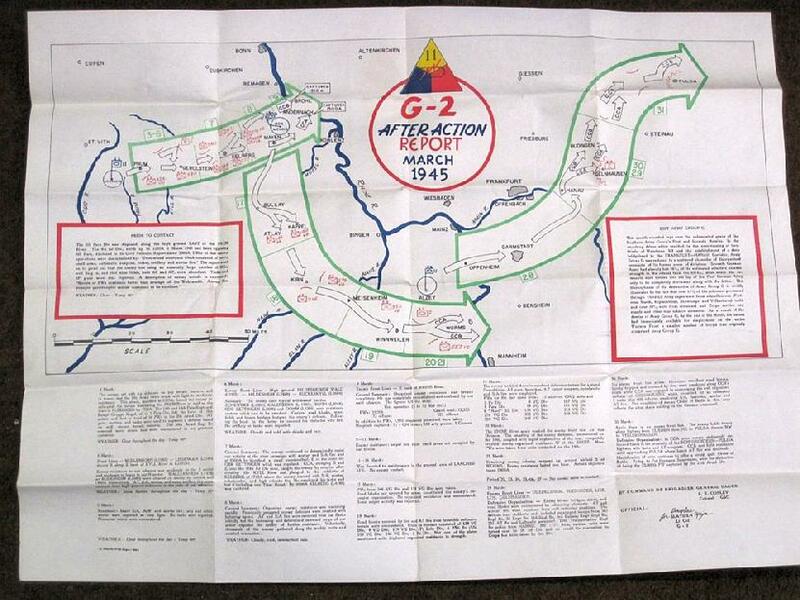 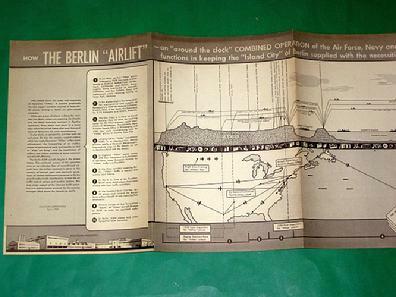 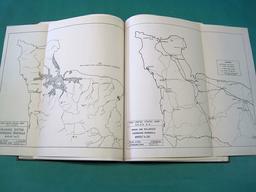 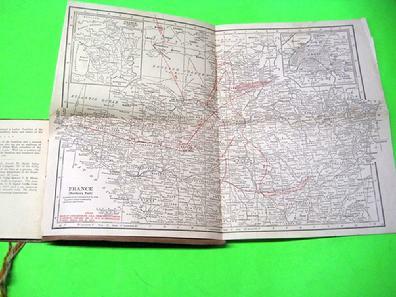 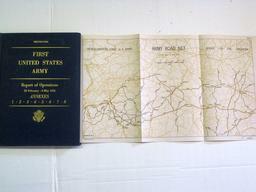 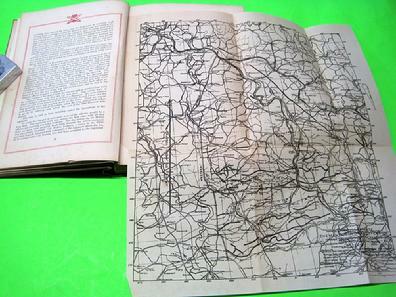 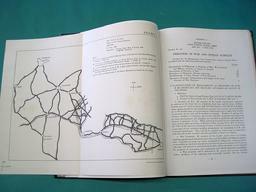 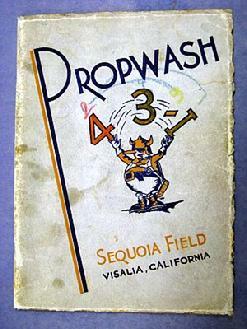 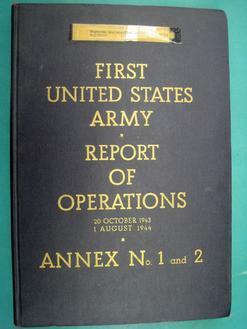 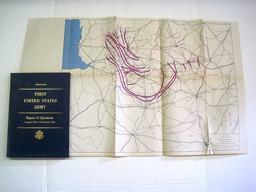 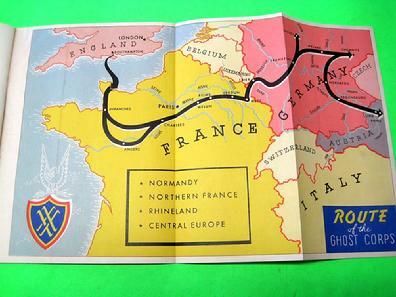 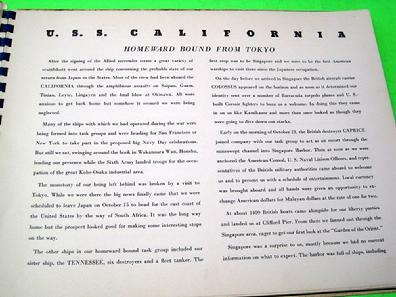 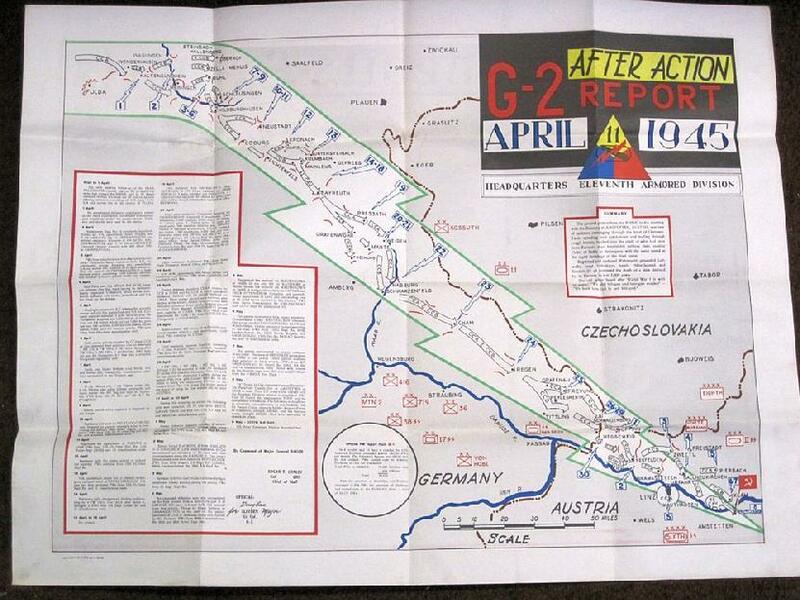 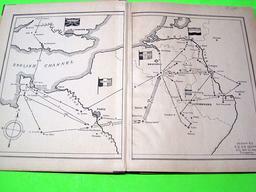 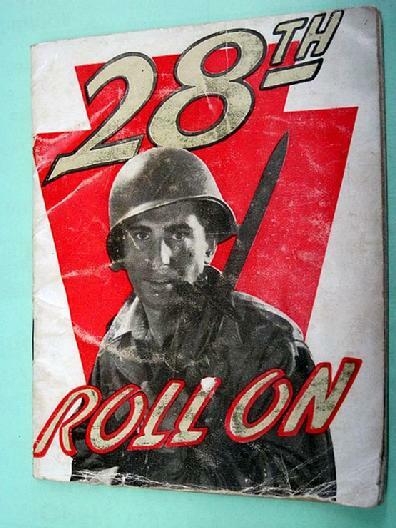 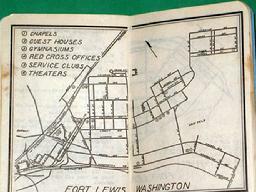 #6 Map- "G2 AFTER ACTION REPORT APRIL 1945" 22 by 29 inches in size, two-sided, folded but in excellent condition. 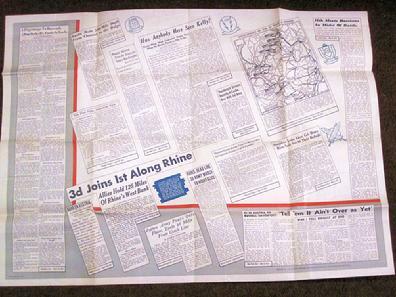 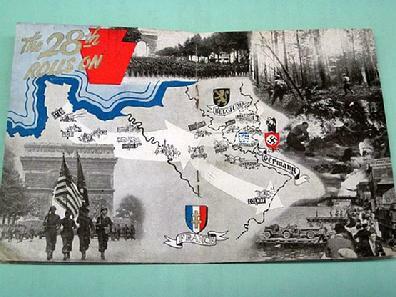 #7 Map (Actually another Unit History) "THE PRESS SAYS" 22 by 29 inches in size, two-sided, folded but in excellent condition. 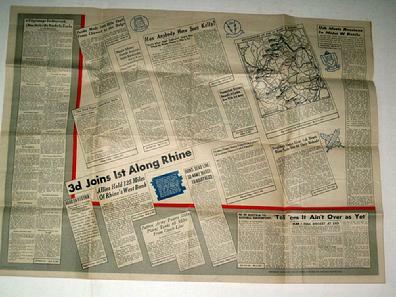 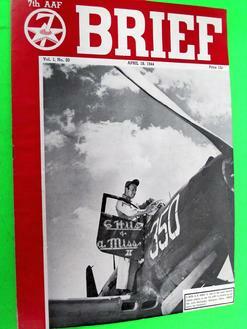 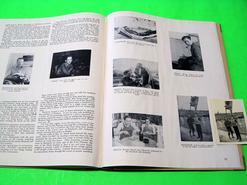 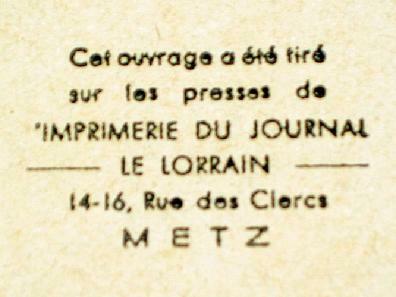 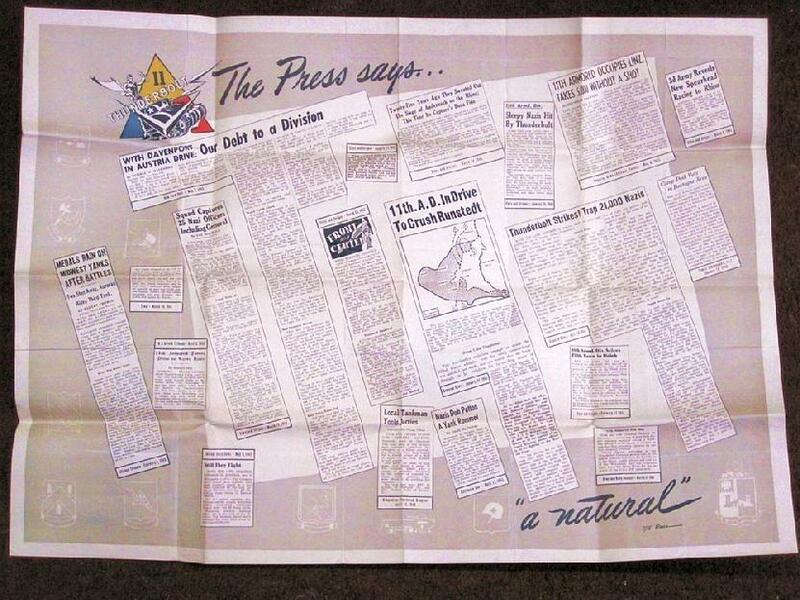 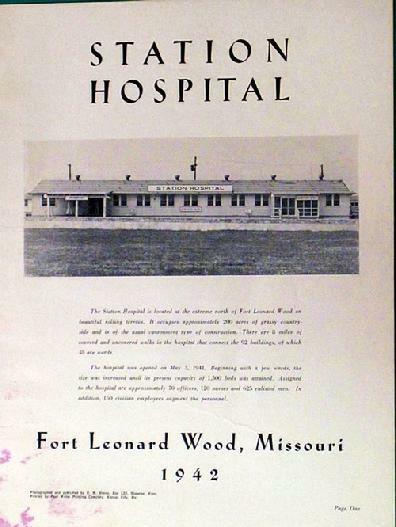 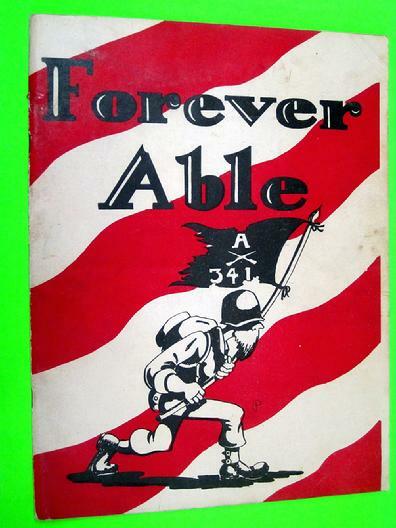 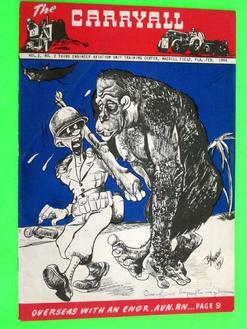 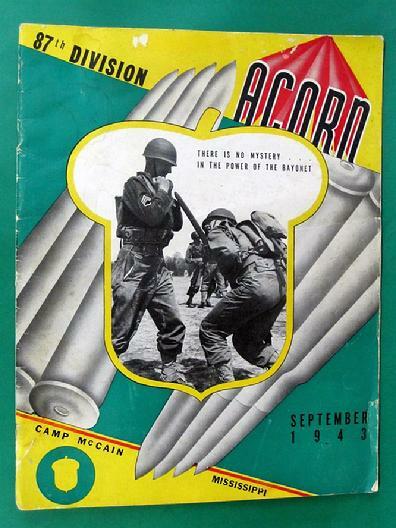 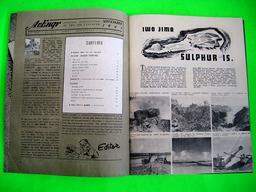 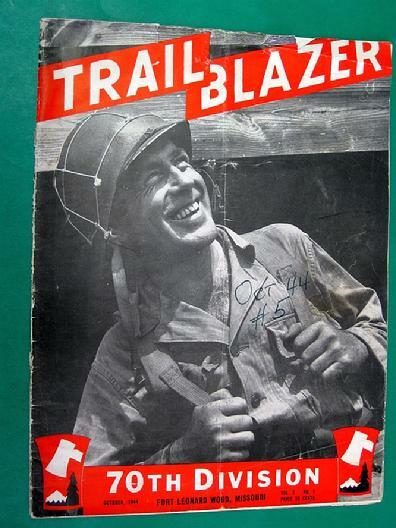 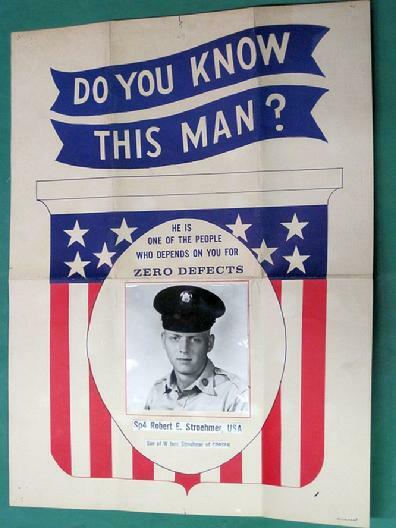 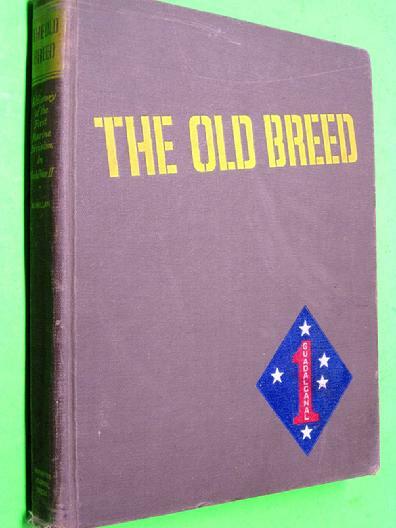 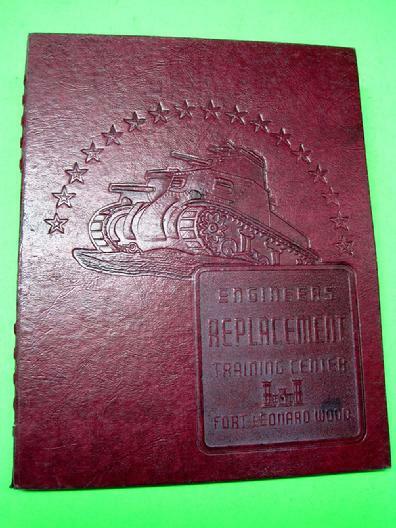 Consists of reprints of numerous newspaper articles about the 11th Armored Division. 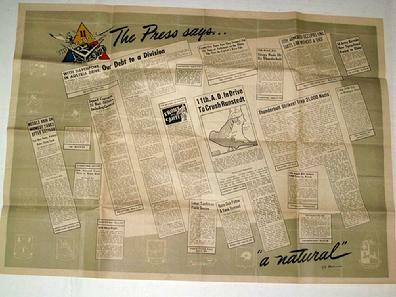 Articles are from all over the United States. 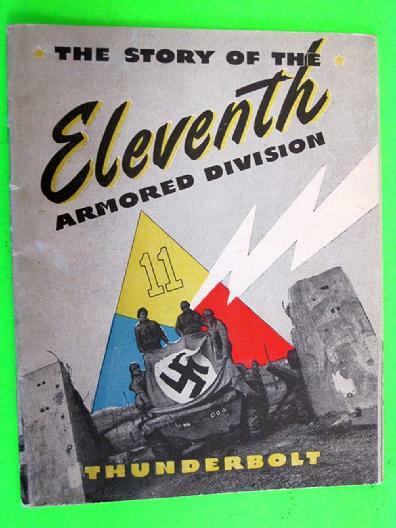 #8 11th Armored Division Patch, fully embroidered, cut edge style, excellent condition. 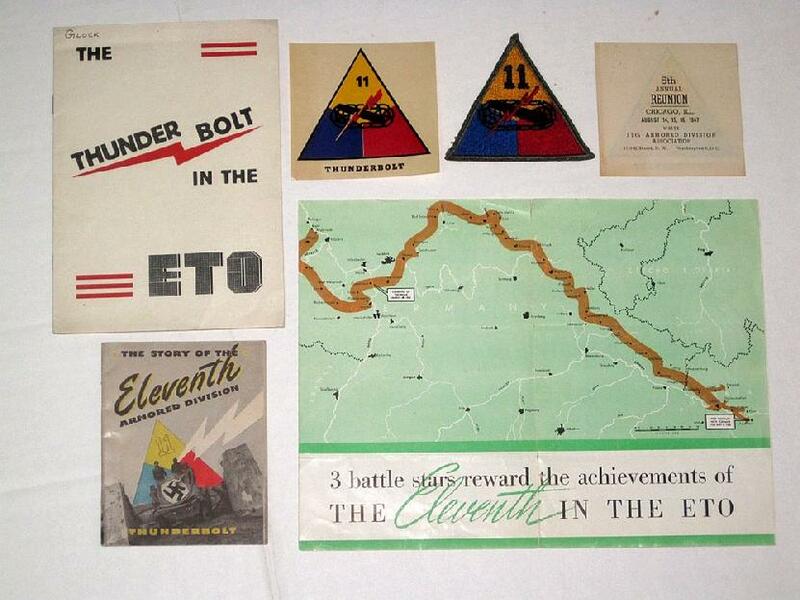 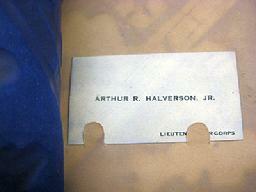 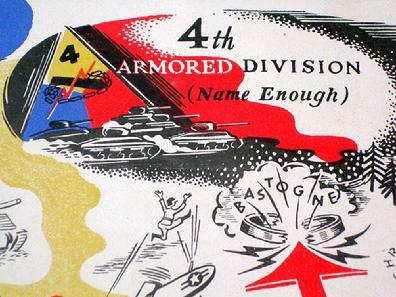 #9 Two 11th Armored Division decals from the 5th annual reunion in Chicago, IL in 1947 Excellent condition. 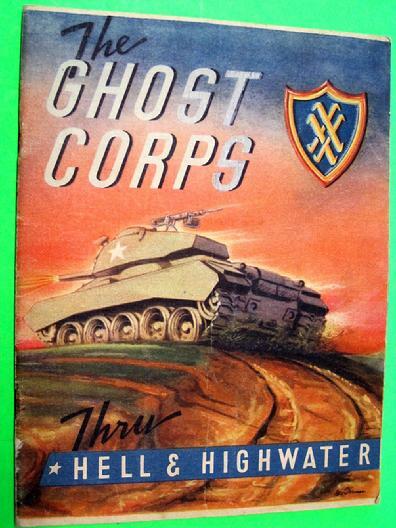 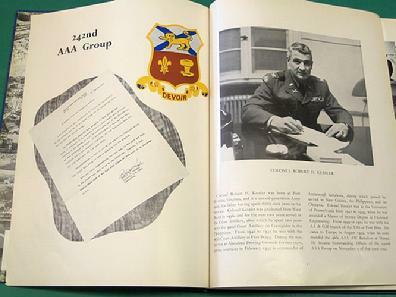 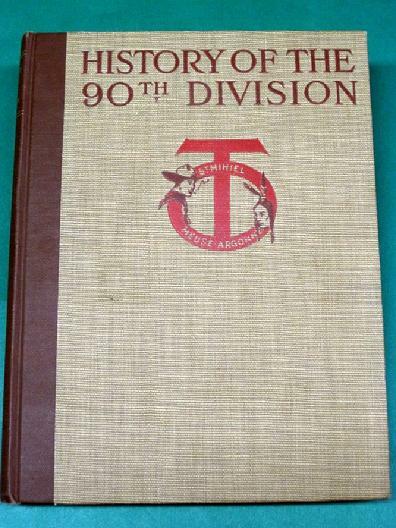 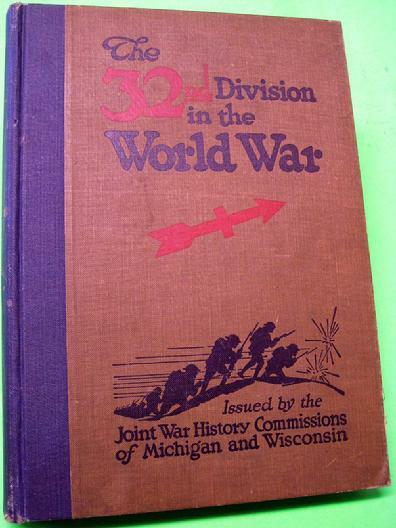 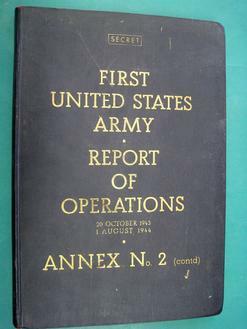 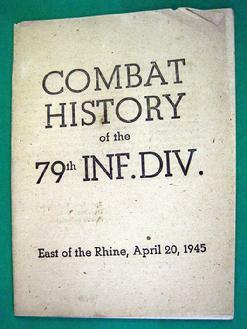 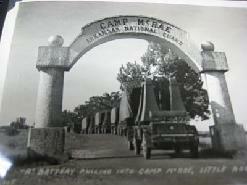 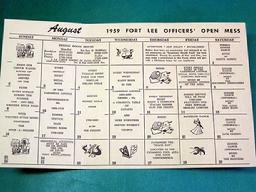 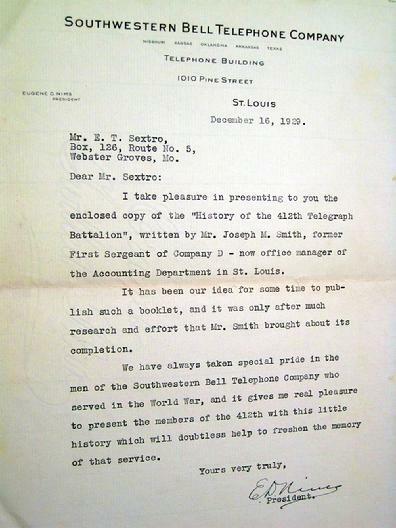 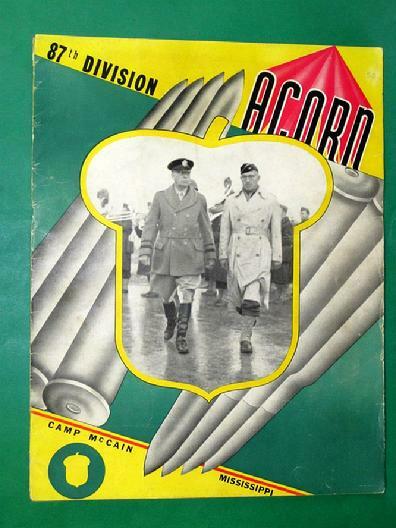 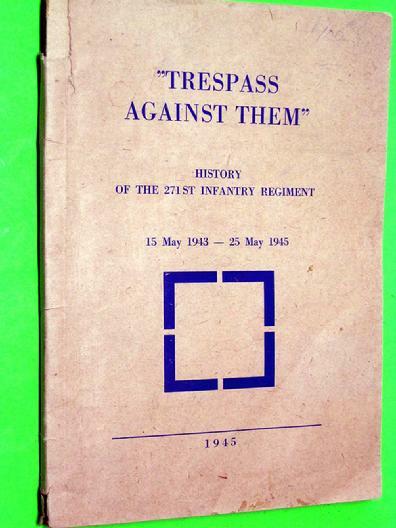 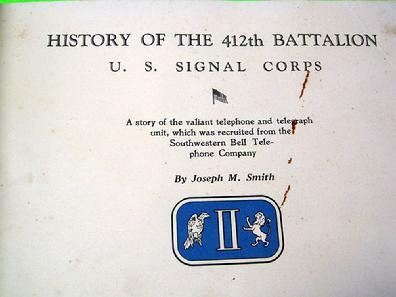 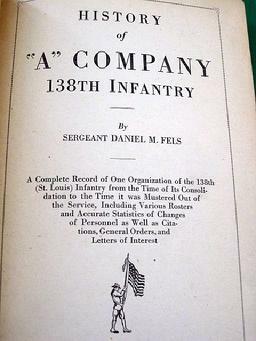 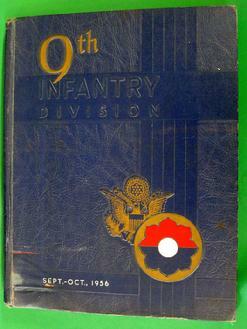 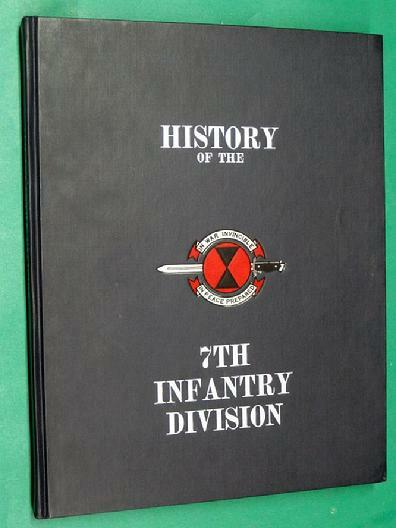 UH190 Unit History of "Company A, 341st Infantry, 86th Black-Hawk Division in the Second World War"
UH188 World War II 5th Armored Division Unit History plus V-Mails. 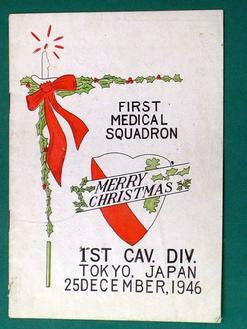 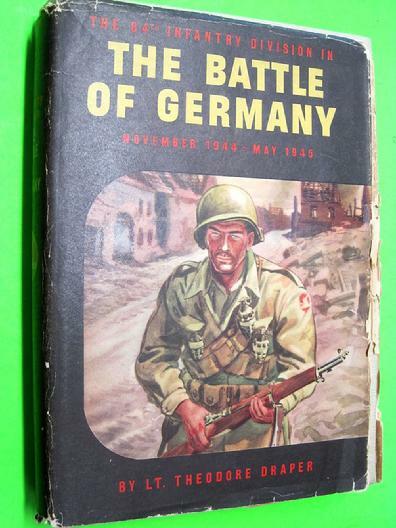 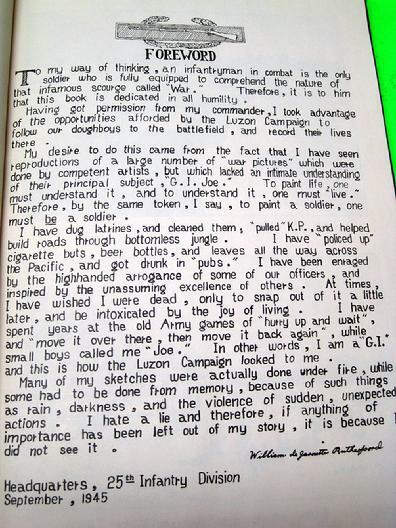 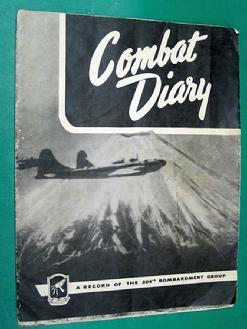 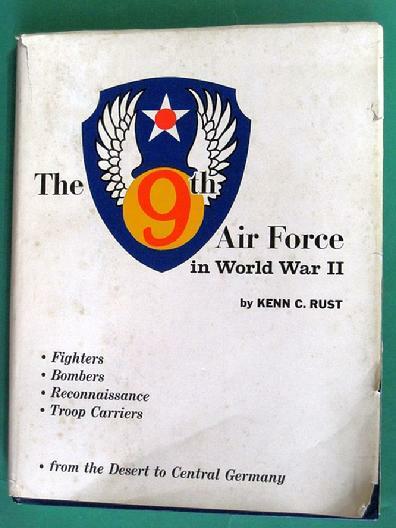 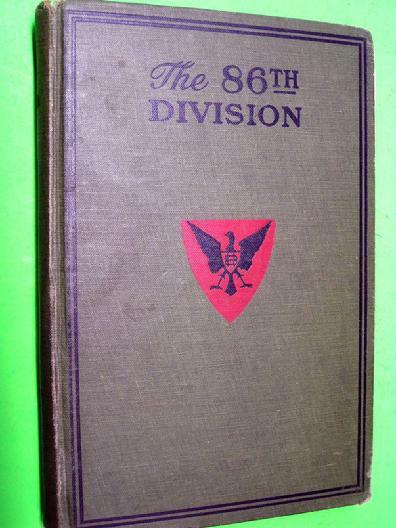 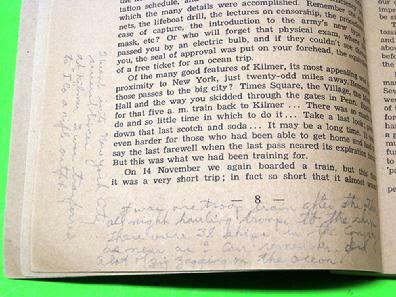 UH186 "The 37th Division in theWORLD WAR"
UH182 "FOLLOW ME, The Story of the Second Marine Division in World War II"
UH181 "Combat Diary, A Record of the 504th Bombardment Group"
UH180 "HISTORY OF THE 7TH INFANTRY DIVISION"
UH178 "HISTORY OF THE 90th DIVISION"
UH167 October 1944 Issue of "TRAILBLAZER"
UH166 "A SPECIAL STUDY OF "OPERATION VITTLES"
UH162 "Yard Long" Photo of BAND OF U.S. 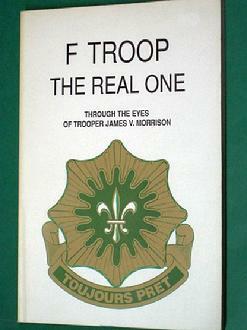 NAVAL TRAINING STATION, GREAT LAKES, ILL.
UH161 "The 5th DIVISION in FRANCE"
Through the Eyes of Trooper James V. Morrison. 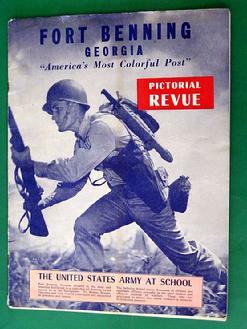 UH152 "FORT BENNING, GEORGIA 'America's Most Colorful Post', Pictorial Revue." 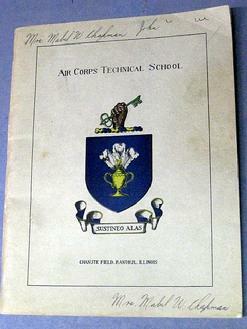 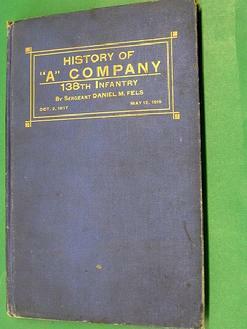 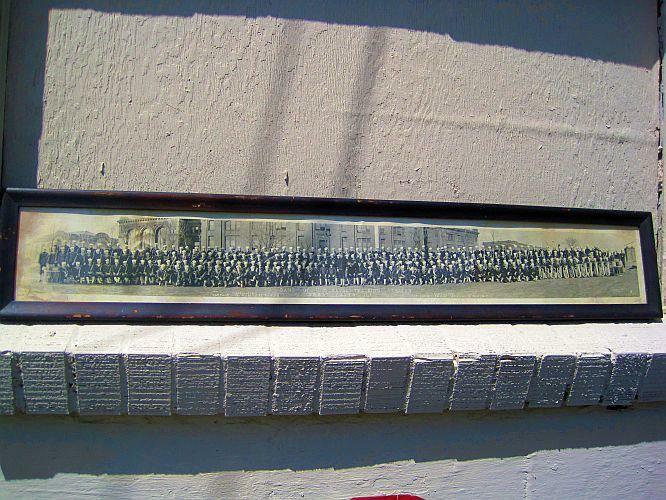 UH144 "HISTORY OF "A" COMPANY, 138th INFANTRY"
UH140 Air Corps Technical School, Chanute Field, Rantoul, Illinois. 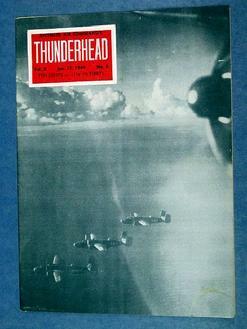 UH130 Antilles Air Command's THUNDERHEAD. 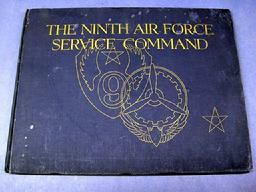 UH129 "THE NINTH AIR FORCE SERVICE COMMAND" Unit History. 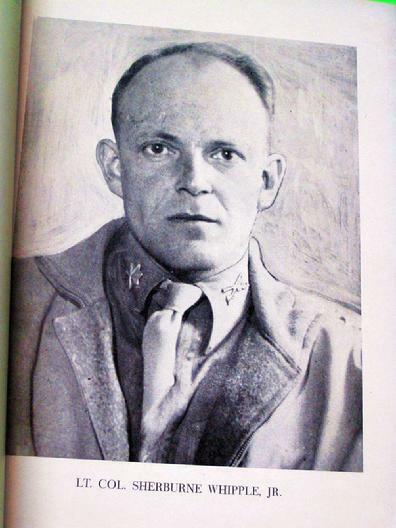 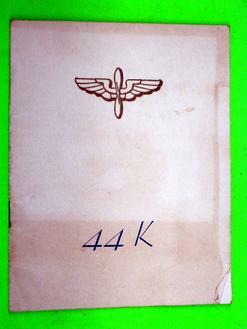 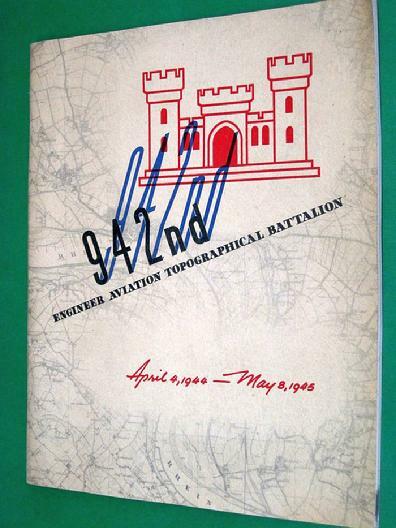 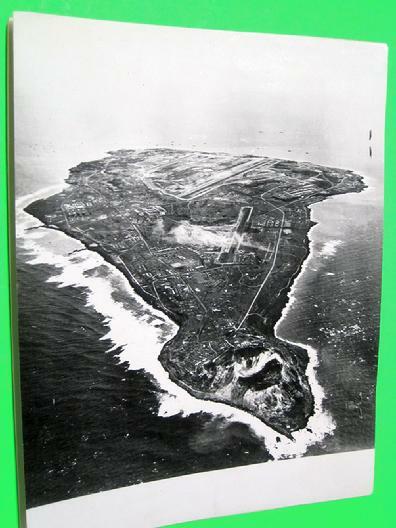 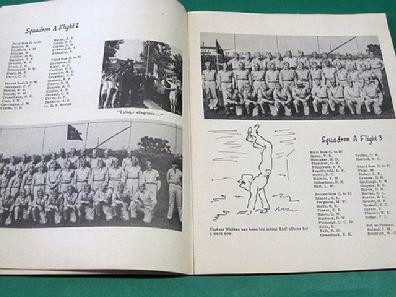 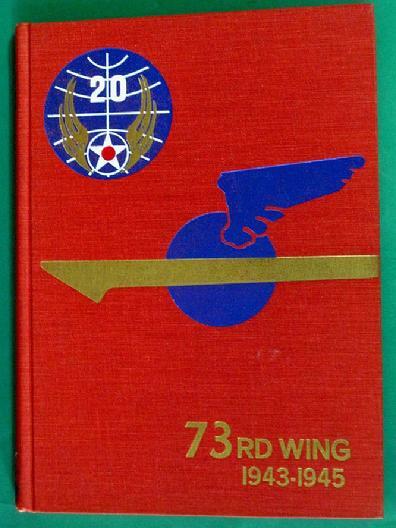 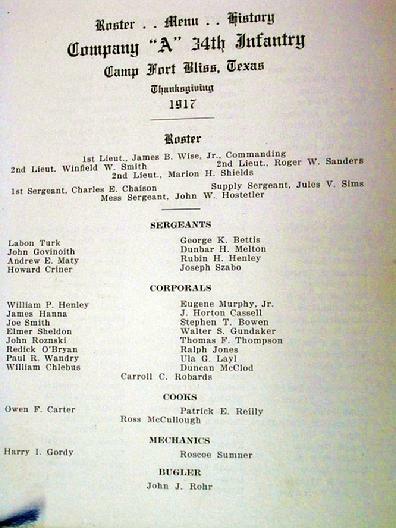 UH126 Unit History of the 942nd Engineer Aviation Topographical Battalion, April 4, 1944 -- May 8, 1945. 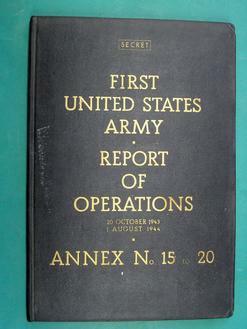 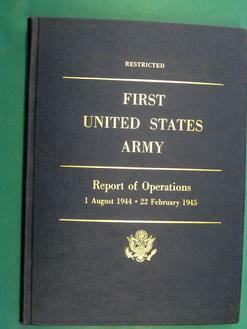 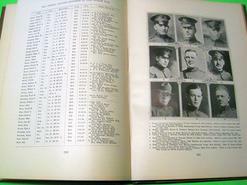 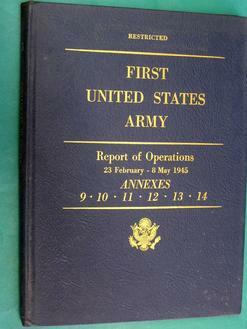 This unit history is softbound, 66 pages, 8 by 10 1/2 inches in size, and in excellent condition. 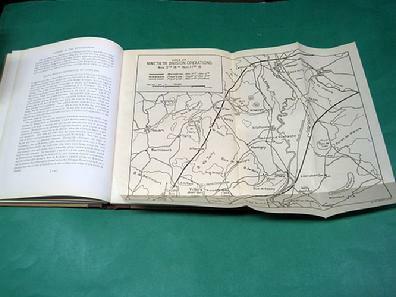 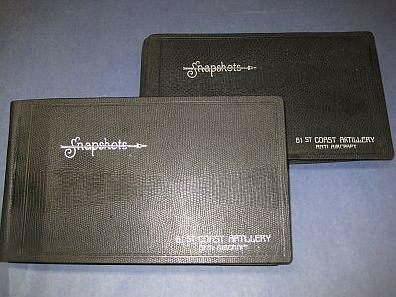 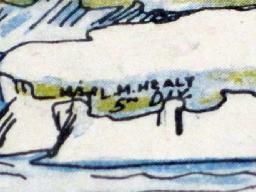 NOTE: This history of a map making unit was acquired with the maps (MS1046, MS1047, MS1048 and MS1049) on our "Other Militaria" page. 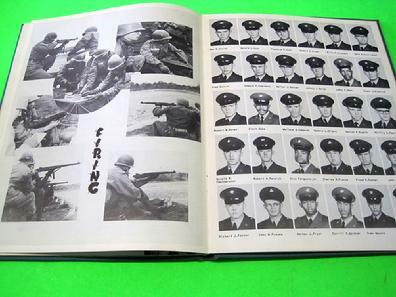 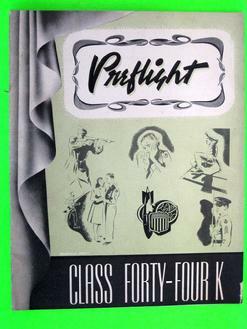 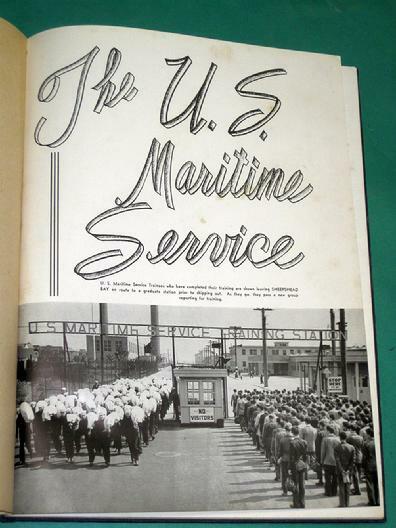 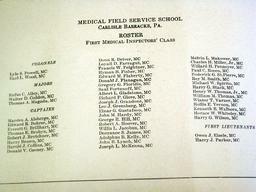 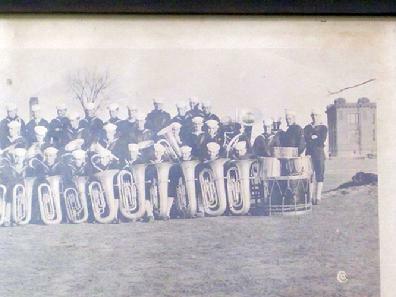 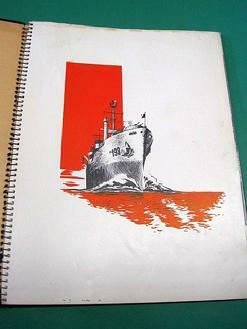 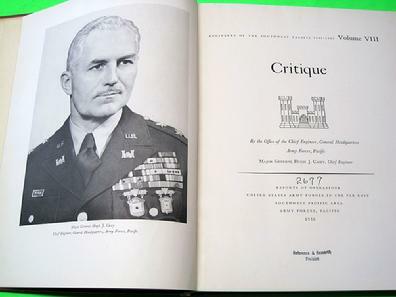 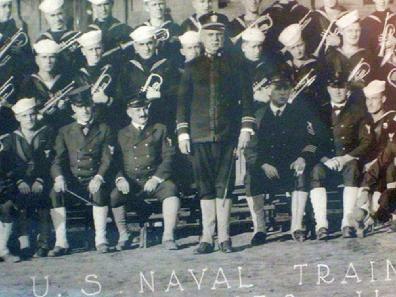 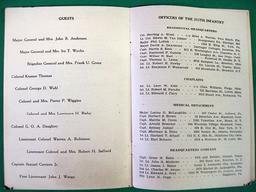 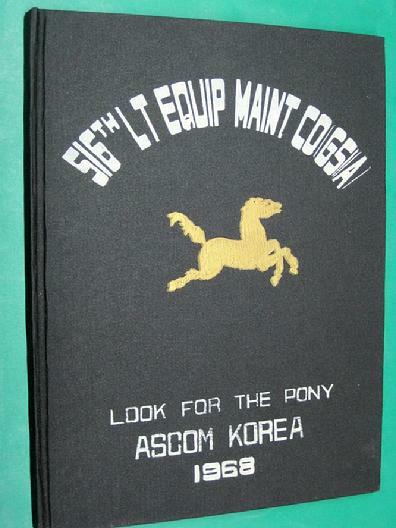 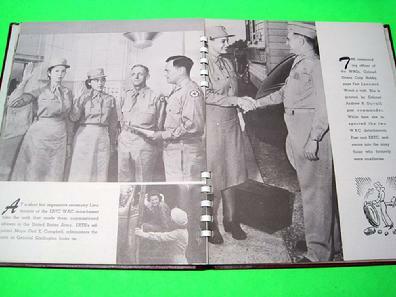 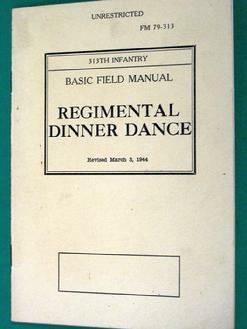 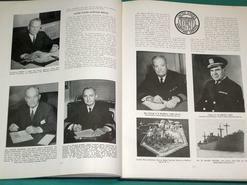 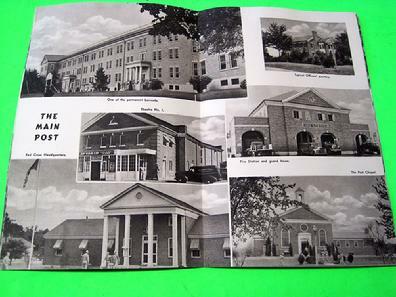 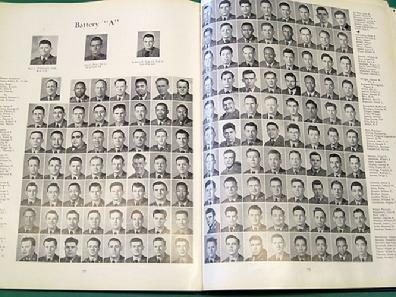 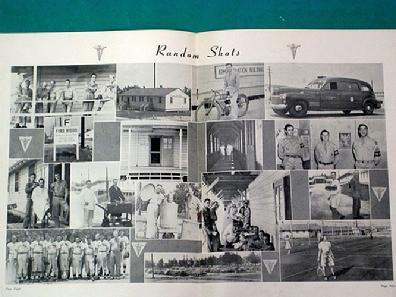 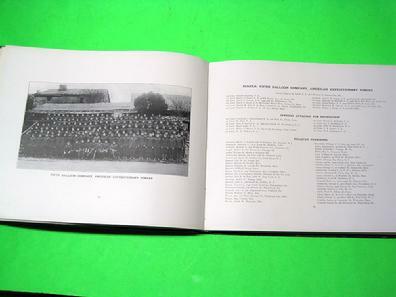 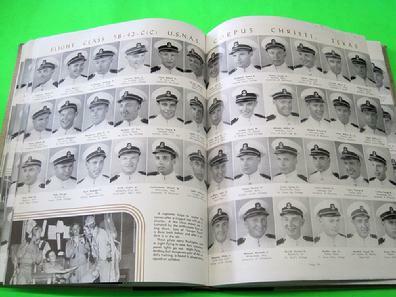 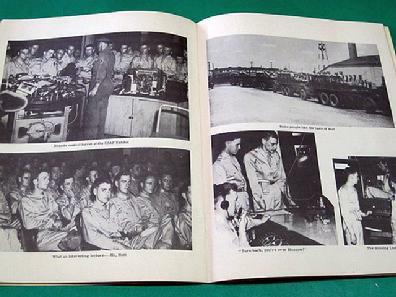 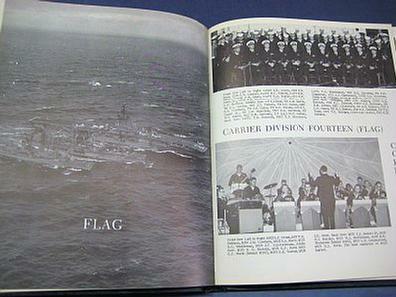 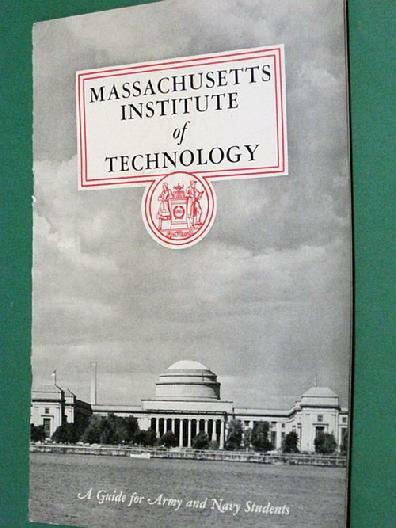 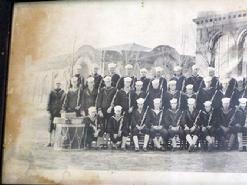 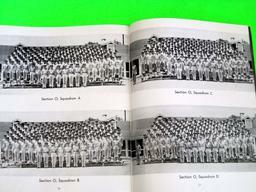 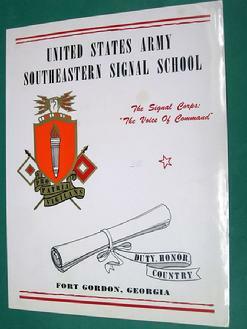 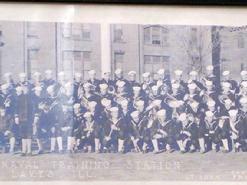 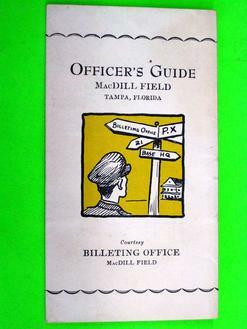 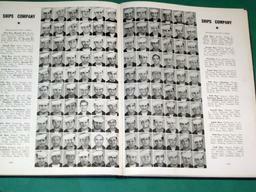 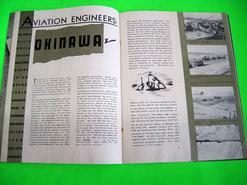 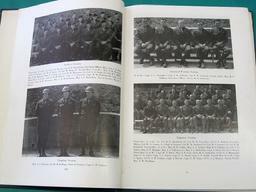 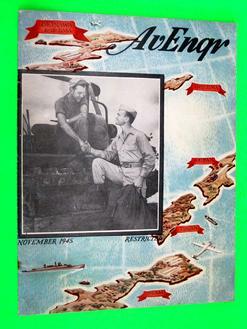 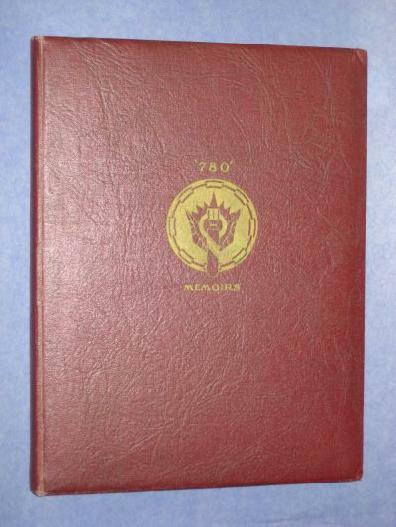 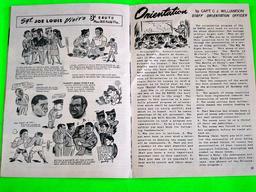 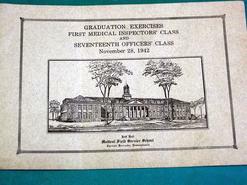 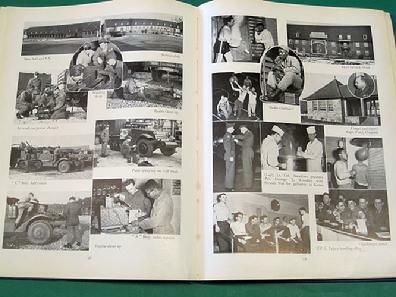 UH125 "MASSACHUSETTS INSTITUTE of TECHNOLOGY, A Guide for Army and Navy Students." 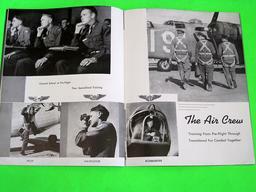 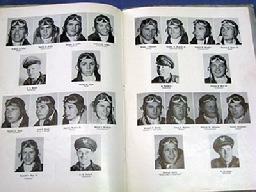 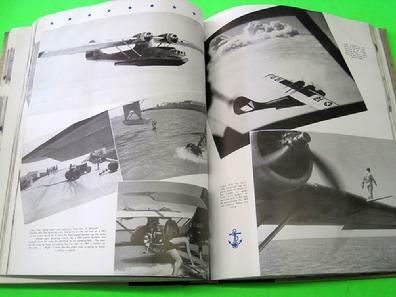 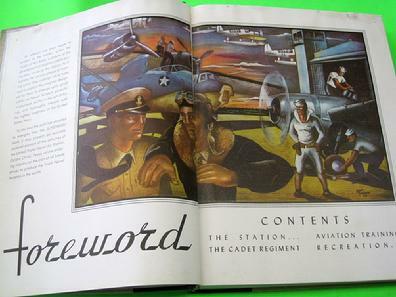 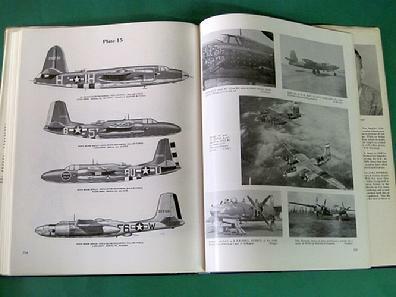 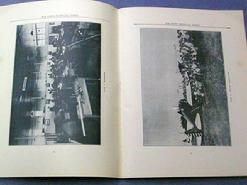 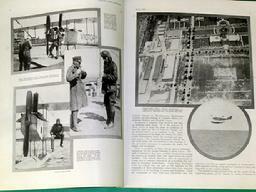 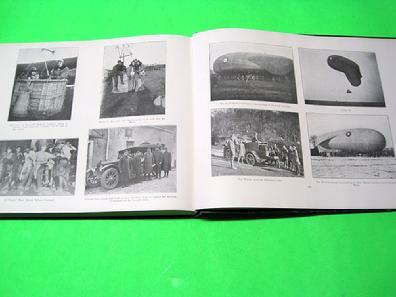 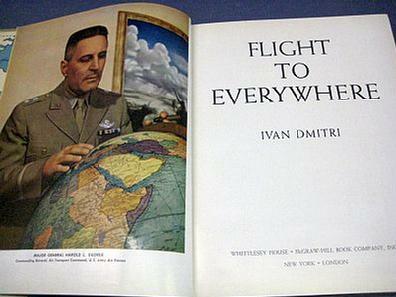 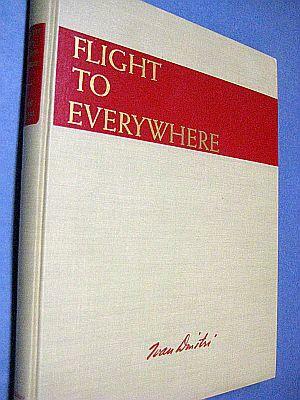 UH123 "FLIGHT TO EVERYWHERE" by Ivan Dmiri, copyright 1944, 240 pages, hundreds of color and black & white photos. 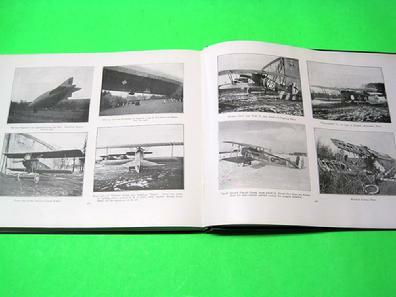 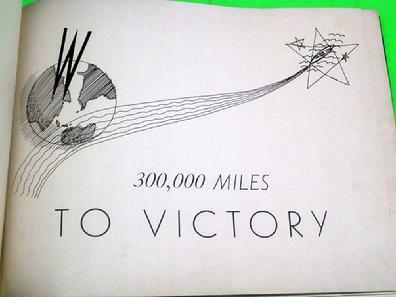 "The Picture Journey of Ivan Dmitri, over 32,000 miles of Air Transport Command Routes through Jungle, Desert and Arctic." 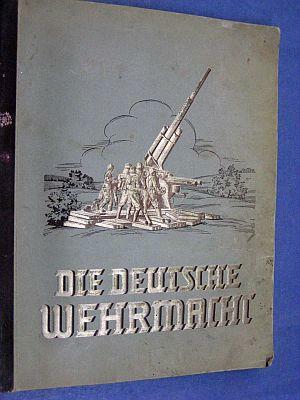 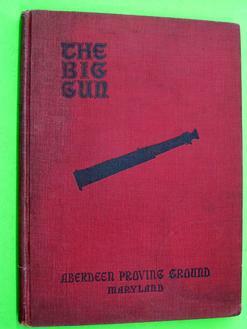 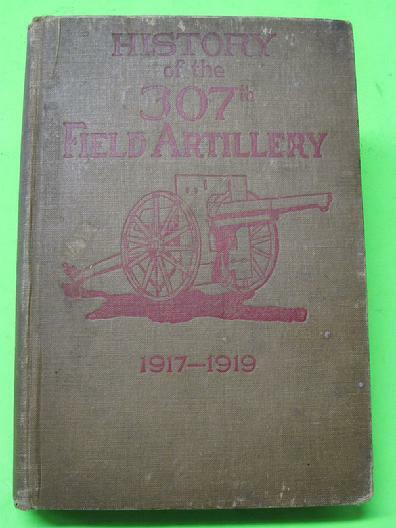 UH-64 THE BIG GUN ABERDEEN PROVING GROUND MARYLAND, Ordnance Department, U.S.A., Aberdeen Proving Ground Maryland, copyright 1918, hardback, 214 pp., very good condition, $125. 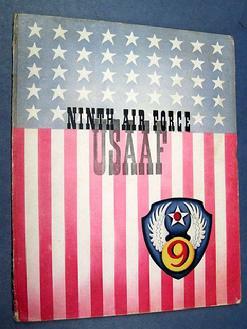 UH-62 PATRON SIX JAPAN 1958, Patrol Squadron Six while deployed in support of U.S. 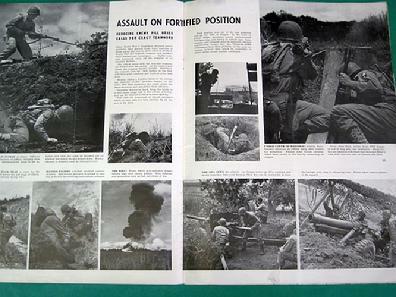 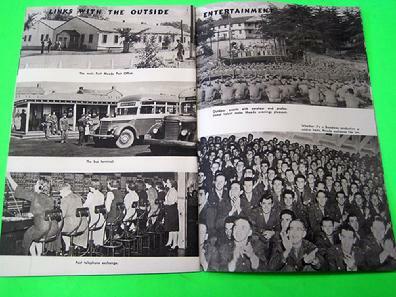 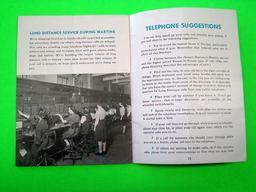 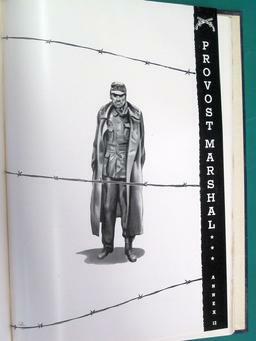 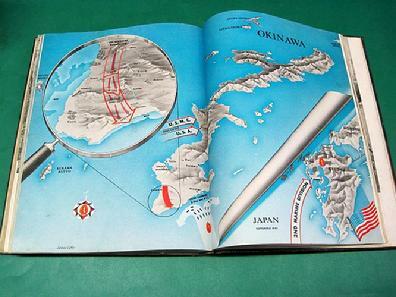 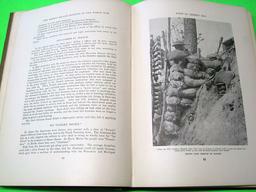 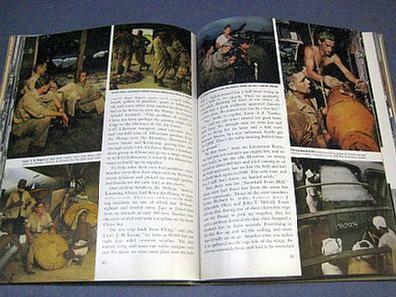 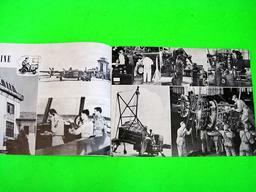 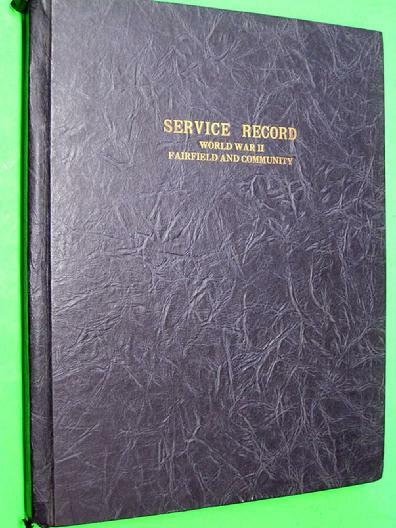 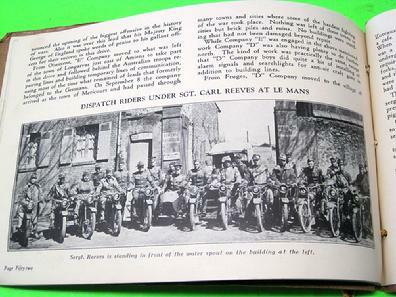 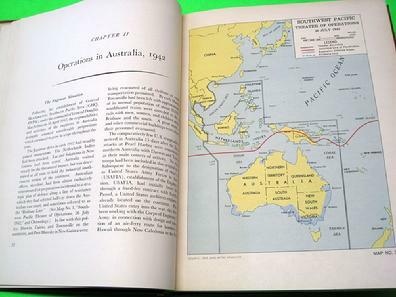 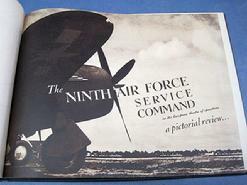 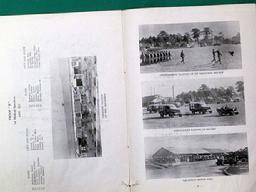 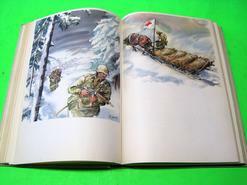 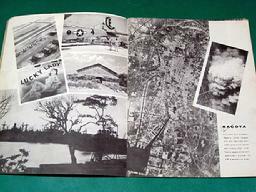 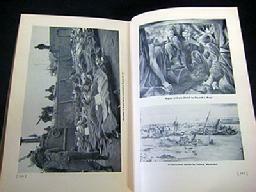 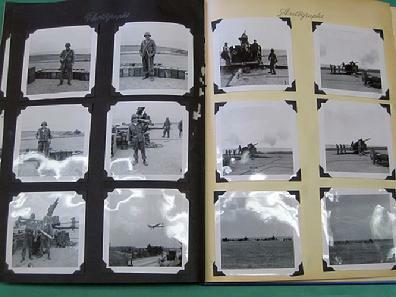 Forces, Japan, during the period March 4-Sept. 16-1958, hardback, approximately 150 pp., very good condition, $45. 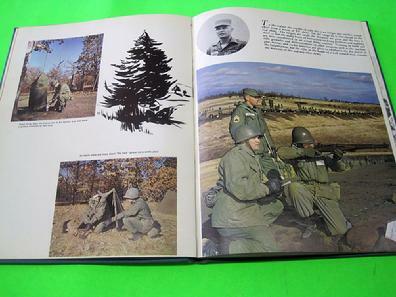 UH-60 D-DAY TO BASTOGNE, Paratrooper recalls World War II experiences while assigned to the 101st Airborne Division, by Robert Houston, copyright 1980, hardbound with dust jacket, 172 pp., $85. 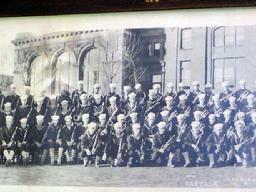 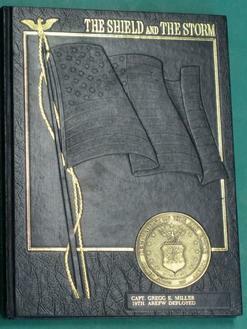 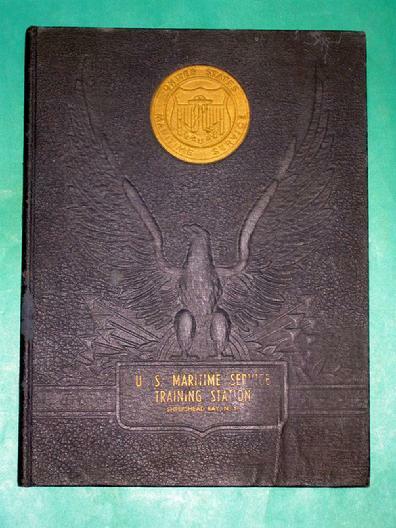 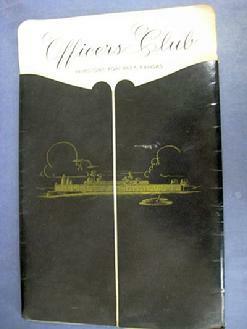 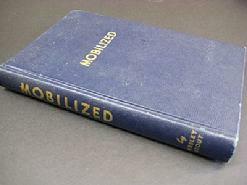 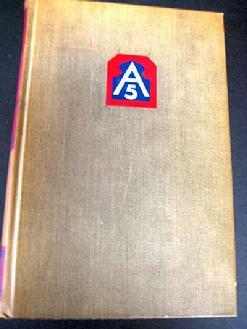 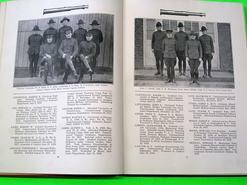 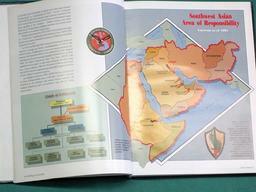 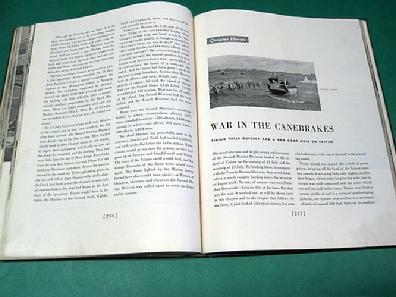 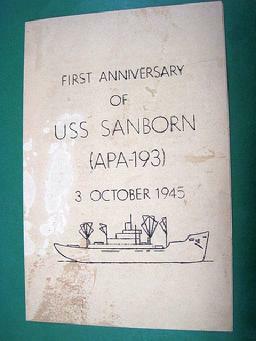 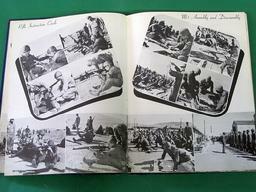 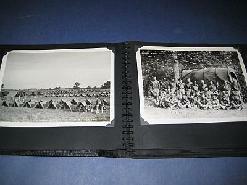 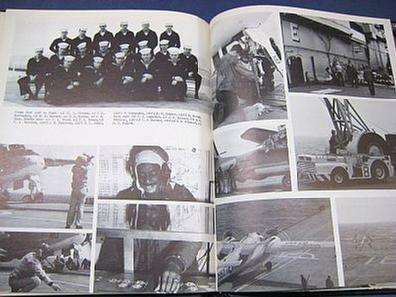 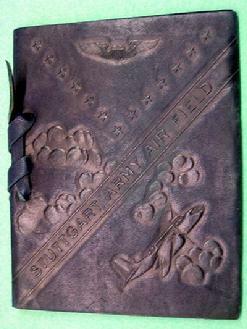 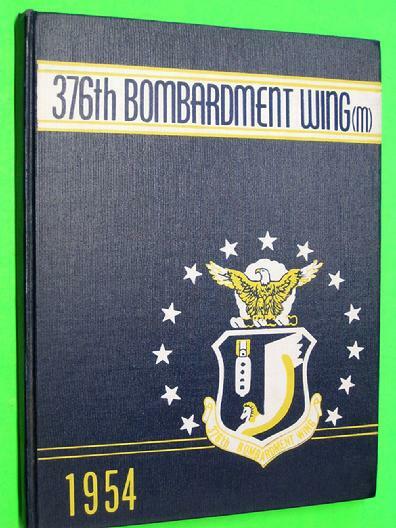 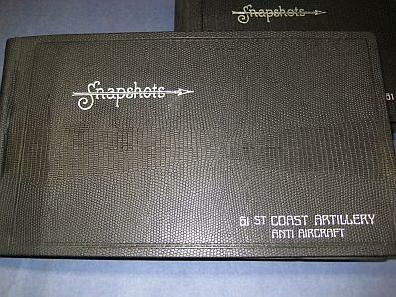 UH-59 SAGA OF THE SEABEES, 85TH BATTALION, 80 pp., hardbound, good condition, $125. 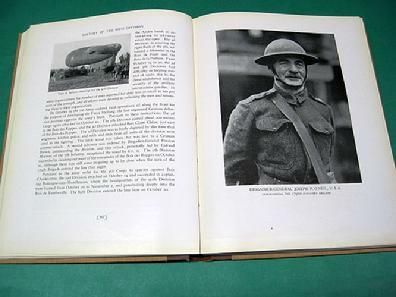 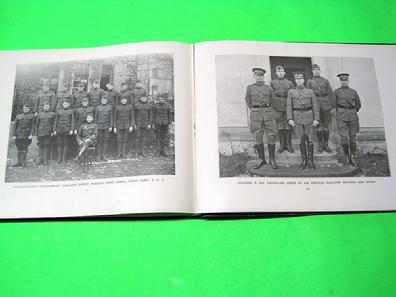 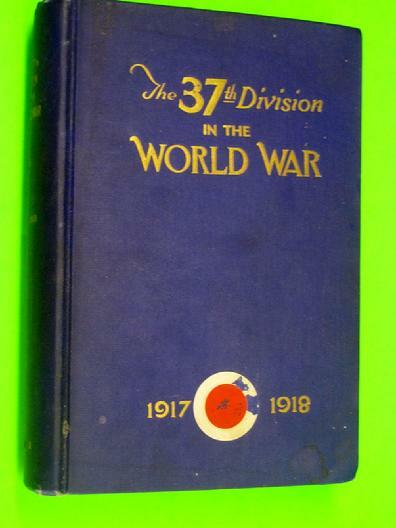 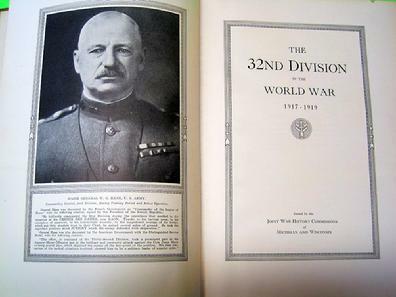 UH-57 PHILADELPHIA IN THE WORLD WAR 1914-1919, Published for the Philadelphia War History Committee, copyright 1922, 785 pp., hardback, very good condition, $125. 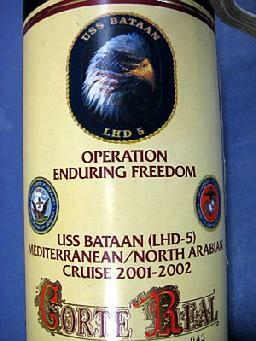 UH-56 THE B.T.O. 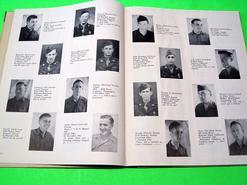 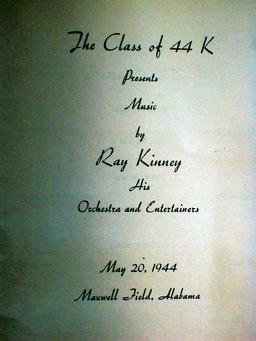 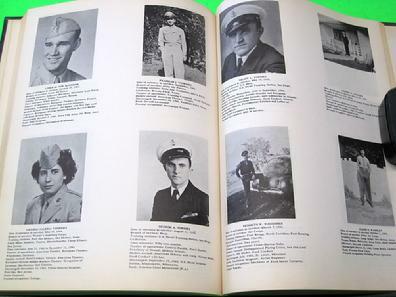 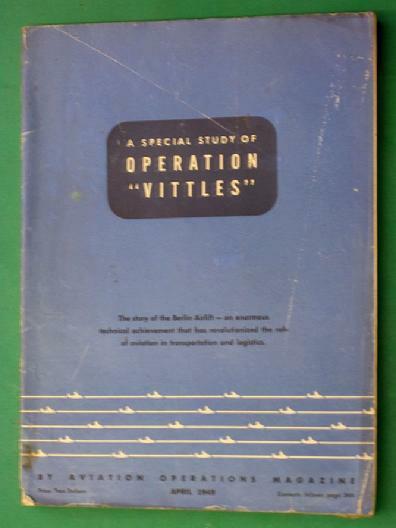 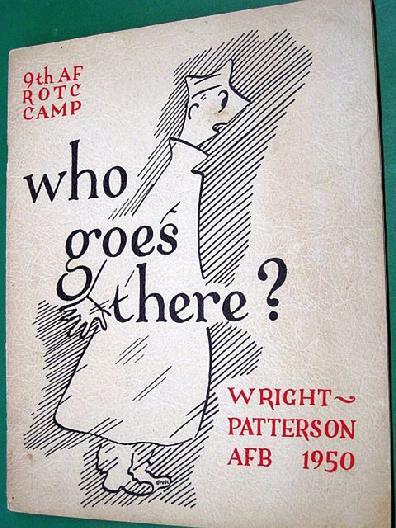 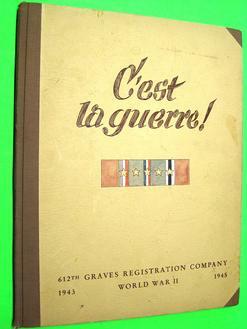 BIG TIME OPERATORS, 1944, Class of 44-1, Darr Aero Tech 52nd A.A.F.F.T.D., Albany, GA, hardback, 48 pp., very good conditions, $65. 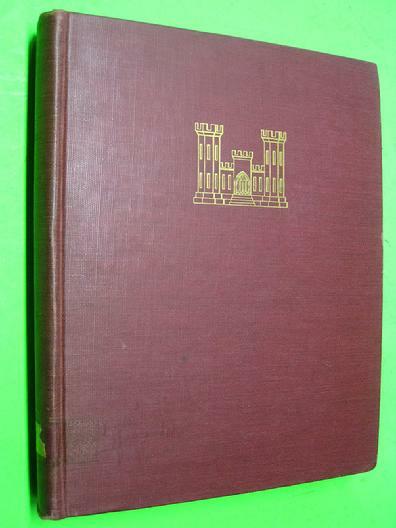 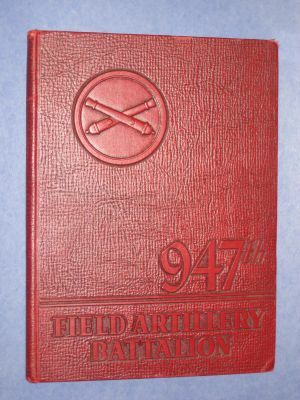 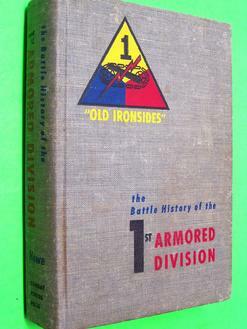 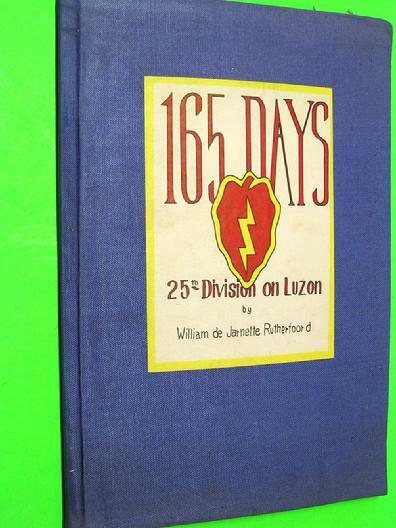 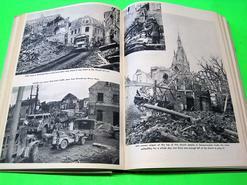 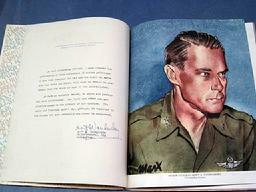 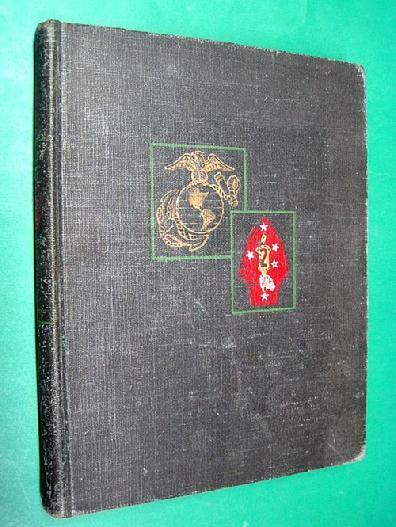 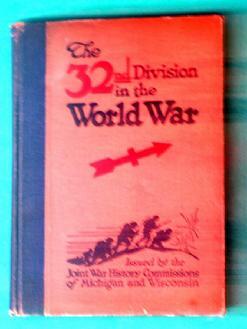 UH-54 HISTORY OF THE 14TH ARMORED DIVISION 1942-1945, by Captain Joseph Carter, hardback, approximately 250 pp, very good condition, $200. 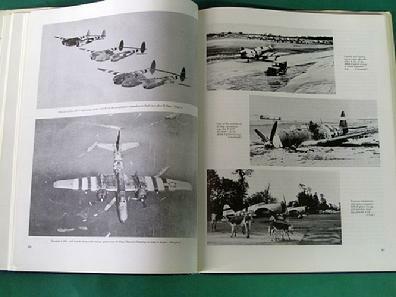 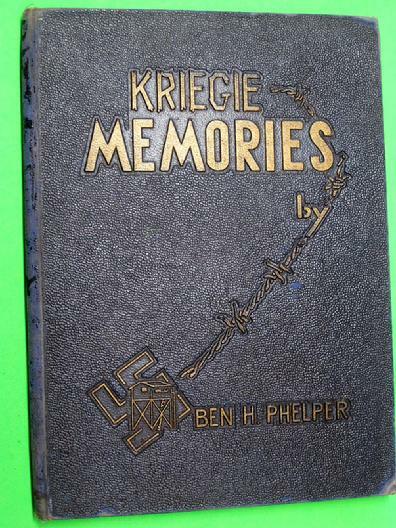 UH-53 MISSION ACCOMPLISHED, A Summary of Military Operations of the XVIII Corps (Airborne) in the European Theatre of Operations 1944-1945, the Story of the Fighting Corps, Published in Schwerin, Germany by the XVIII Corps (Airborne), hardback, ex libris, 35 pp., very good condition, $145.